Original, quality pair of 18th or early 19th century cowhorn, spherical shaped door knobs with a standard square bar and grub screw adjustment system to fit standard mortice and rim locks and latches. 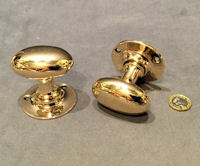 Two circular brass backplates copied from originals have been fitted, each with two concealed screw holes for mounting. 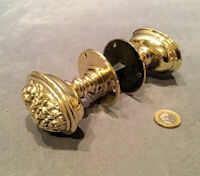 A most unusual pair of door knobs very difficult to find in horn and complete and in good and working order. Backplate 2", knob 2" and 1.75". Original, quality pair of late 19th century spherical shaped ebony door knobs with circular backplates and a threaded standard square bar and grub screw adjustment system to fit standard mortice locks and latches. Each backplate has two countersunk screw holes for mounting and all is complete and in good and working order. Backplate 2.25", knob 2" diam and 3.25" front to back. Original, quality pair of 1920's oval pink brass door knobs, with a square bar included to fit standard mortice locks and latches and circular backplates each with three countersunk screw holes for mounting. Complete and in good and working order. Backplate 2.25" diam and knob 2.25" x 1.25" and 2.25" front to back. 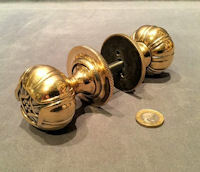 Original, quality pair of mid to late 19th century spherical shaped heavy brass door knobs. With a threaded standard square bar and grub screw adjustment system to fit both mortice and rim locks and latches with circular backplates, each have two concealed countersunk screw holes for mounting. All is complete and in good and working order. Backplate 2" diam, knobs 2" diam and 2" front to back. 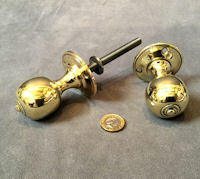 Original, quality pair of mid to late 19th century spherical shaped heavy brass door knobs. With a threaded standard square bar and grub screw adjustment system to fit both mortice and rim locks and latches. Replacement brass backplates have been made to suit and each backplate has three countersunk screw holes for mounting. All is complete and in good and working order. Backplate 2" diam, knobs 1.75" diam and 1.75" front to back. 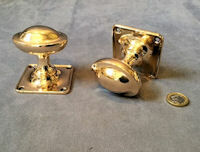 Original, quality pair of 1920's brass door knobs. With a square bar included to fit standard mortice locks and latches. Each circular backplate has three countersunk screw holes for mounting and the knobs have an Art and Crafts design with an opening bud form. Polished and complete and in good and working order. Price is per pair. 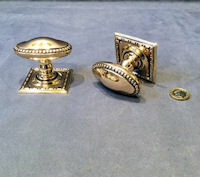 Original, quality near pair of late 19th cenutry large octagonal shaped brass door knobs with matching backplates each with two countersunk screw holes for mounting, one is original and one is a replacement made to suit. With a threaded standard square bar and grub screw adjustment system to fit both mortice and rim locks and latches. This example is ideal for a larger exterior front door. All is complete and in good and working order. Backplate 2.5" diam, knob 2.5" diam and 2.75" front to back. Original, quality 1930's / 40's large octagonal shaped cast pink brass door handle with the matching backplate with four countersunk screw holes for mounting. 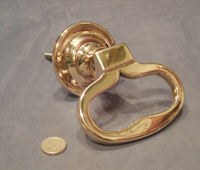 This larger than average knob will turn a handle but is also a good enough size to use as a door pull. All is complete and in good and working order. Backplate 3.25", knob 2.75" and 2.5" front to back. Original, quality pair of 1920's cast pink brass octagonal shaped door knobs. With a square bar included to fit standard mortice locks and latches and matching backplates, each with four countersunk screw holes for mounting. 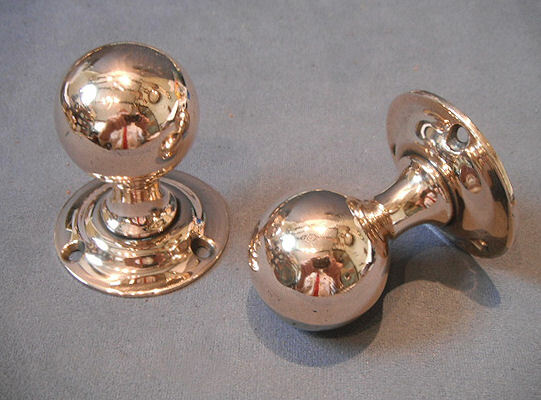 A great looking pair of turning door knobs. Complete and in good and working order. Backplates 2.75", knob 2.25" diam and 2.5" front to back. Original, quality pair of 1920's oval shaped pink bass door knobs with circular backplates and a square bar included to fit standard mortice locks and latches. Each backplate has four countersunk screw holes for mounting and all is complete and in good and working order. Backplates 2 3/8", knob 2.5" x 1.5" and 2.5" front to back. Price is per pair. Original, quality pair of late 19th century spherical shaped cast brass door knobs with replacement circular brass backplates made to suit. With a threaded standard square bar and grub screw adjustment system to fit both mortice and rim locks and latches. Each backplate has three countersunk screw holes for mounting and all is complete and in good and working order. 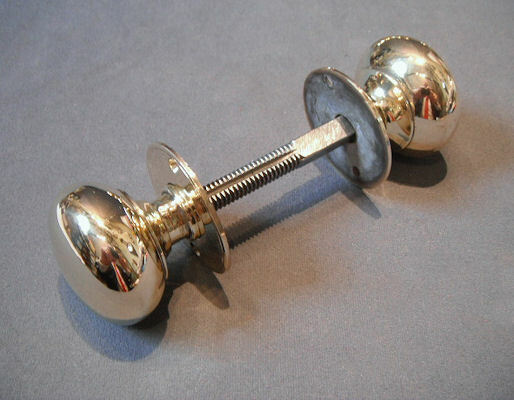 A good heavy pair of knobs. Backplates 2", knobs 1.75" and 2" front to back. 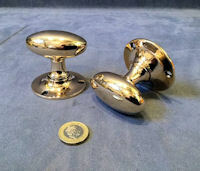 Original, quality pair of circa 1900, spherical shaped brass door knobs with replacement circular brass backplates made to suit. With a threaded standard square bar and grub screw adjustment system to fit both mortice and rim locks and latches. Each backplate has three countersunk screw holes for mounting. Some minor dents, otherwise complete and in good and working order. Backplates 2.25" diam, knobs 2" and 2" front to back. Original, quality pair of late 19th century spherical shaped brass door knobs with replacement circular brass backplates made to suit. With a threaded standard square bar and grub screw adjustment system to fit standard rim locks and latches. Each backplate has three countersunk screw holes for mounting and all is complete and in good and working order. Backplates 2.25", knobs 2" and 2" front to back. Original, quality 1930's wrought door handle with a petal shaped backplate with four screw holes for mounting, a large ring handle with a turning action and with a square bar included to fit standard mortice locks and latches. All has been cleaned and repainted black and is complete and in good and working order. Backplate 4" diam, ring 4" diam and total 6" tall. 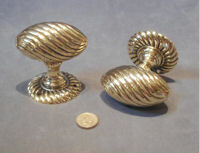 Original, quality mid to late 19th century cast brass spherical shaped door knobs. With a threaded standard square bar and grub screw adjustment system to fit both mortice and rim locks and latches. Replacement circular brass backplate made to suit are included, each with two concealed brass countersunk screw holes. 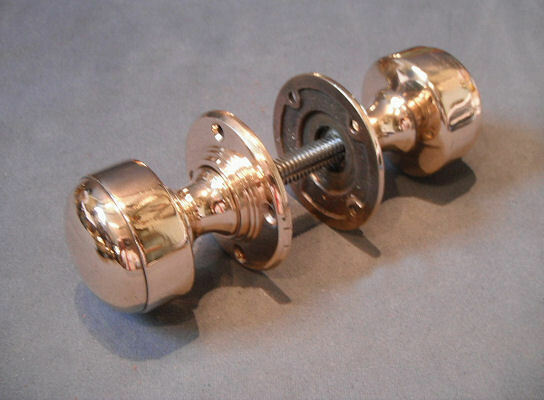 Good heavy brass door knobs. Complete and in good and working order. Backplate 1.75", knobs 1.75" diam and 2" front to back. Price is per pair. 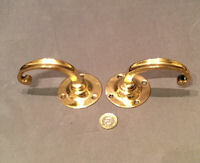 Original, quality pair of late 19th century very decorative cast brass door 'T' door handles. With a square bar included to fit standard mortice locks and latches. This most unusual pair of handles are formed with deep embossed designs of acanthus leaves with matching circular backplates. The backplates have a concealed fittings so when mounted; no screws are visible. All is complete and in good and working order. Backplate 2.1/8", handle 3.25" x 1" and total 2.25" front to back. 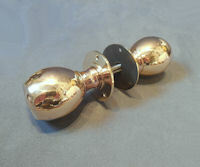 Original, quality pair of 1920's cast pink brass door knobs. With a square bar included to fit standard mortice locks and latches. These unusual examples are angled oval shaped with six facets to the front and circular backplates, each with four countersunk screw holes for mounting. All is complete and in good and working order. Backplates 2.5" diam, knob 2.75" x 1.5" and 2.5" front to back. 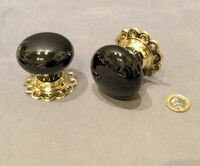 Original, quality pair of late 19th century ebony door knobs with one original and one replacement brass backplate made to suit. With a threaded standard square bar and grub screw adjustment system to fit both mortice and rim locks and latches. Each backplate three countersunk screw holes for mounting and all is complete and in good and working order. Backplate 2.25", knob 2.25" and 2.5" front to back. 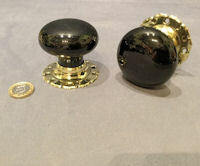 Original, quality pair of late 19th century ebony door knobs with replacement circular backplate made to suit. With a threaded standard square bar and grub screw adjustment system to fit both mortice and rim locks and latches. Each backplate has three countersunk screw holes for mounting and all is complete and in good and working order. Backplates 2.25", knob 2.25" and 2.5" front to back. 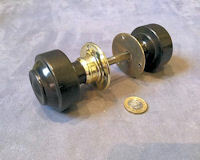 Original, quality pair of late 19th century ribbed ebony door knobs with circular backplates and standard square bar to fit a standard motrice locks and latches. Each backplate has three countersunk screws for mounting and some ribbing. Some minor scuffs to the ebony but otherwise all is complete and in good and working order. Backplate 2.25", knob 2.25" and 2.75" front to back. Pair of 1920's / 30's oval shaped cut glass door knobs with circular chromed backplates and a standard square bar to fit standard mortice locks and latches. Each backplate has three countersunk screw holes for mounting. Some minor chips to the high points, otherwise complete and in good and working order. 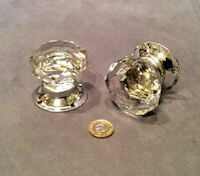 Most unusual to find oval cut glass door knobs and a good long run. Backplates 2.75" diam, knob 2.25" x 1.5" and 2.5" front to back. Price is per pair. Some matching keyhole covers may well be available ref code: KC445. Original, quality pair of late 19th century cast pink brass octagonal shaped door handles with a threaded standard square bar and grub screw adjustment system to fit both mortice and rim locks and latches. 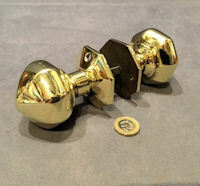 This most unusual pair of door knobs have matching backplates, each with two countersunk screw holes for mounting and are complete and in good and working order. Backplates 2.25" diam, knobs 2.25" and 2.75" front to back. 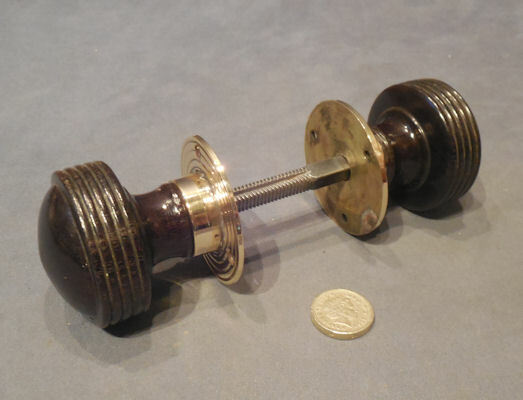 Original, quality late 19th century pair of turned and ribbed ebony door knobs with the original cast brass decorative backplates and a threaded standard square bar and grub screw adjustment system to fit both mortice and rim locks and latches. Complete and in good and working order. Backplate 2.25", knob 2.25" and 2.5" front to back. Original, quality pair of late 19th century larger than average superb cast pink brass octagonal shaped door handles with the original matching backplates, a square bar to fit standard mortice locks and latches. Some knocks and scuffs consistent with use and some old screw holes drilled rather badly, now filled and patched. All is now complete and in good and working order and ideal for a huge front door. Backplate 3.25" diam, knob 2.75" diam and 3.25" front to back. 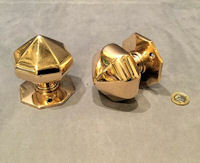 Original, quality pair of late 19th century brass drop ring, turning door handles on the original diamond shaped backplates. The drop rings are in the 18th century shape with a stepped outer rim to the backplates, each with four countersunk screw holes for mounting and a square bar to fit standard mortice locks and latches. Complete and in good and working order. Backplate 4" x 4" and 0.25" front to back. Total ring handle 4" x 3.5", total front to back 1.5". Original, quality pair of 1920's oval pink brass doorknobs with a square brass backplate with four countersunk screw holes for mounting and with a threaded standard square bar and plate adjustment to fit standard rim locks and latches. All is complete and in good and working order. Backplate 2.25" square, knob 2.25" x 1.5" and 2.25" front to back. Original, quality pair of 1920's oval pink brass door knobs with circular backplates, and with a square bar included to fit standard mortice locks and latches. Each backplate has three countersunk screw holes for mounting and all is complete and in good and working order. Backplate 2.25", knob 2.25" x 1.5" and 2.25" front to back. Original, quality pair of 1920's oval pink brass door knobs with circular backplates and with a square bar included to fit standard mortice locks and latches. Each backplate has four countersunk screw holes for mounting and all is complete and in good and working order. Backplate 2.25", knob 2.25" x 1.5" and 2.25" front to back. 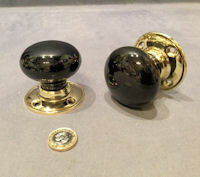 Original, quality pair of late 19th century spherical shaped black ceramic door knobs with brass petal shaped backplates, each with two countersunk screw holes for mounting and a square bar to fit standard mortice locks and latches. Complete and in good and working order. Backplate 2.25", knob 2.25" and 2.25" front to back. Original, quality pair of late 19th century spherical shaped black ceramic door knobs with brass petal shaped backplates, each with four countersunk screw holes for mounting and a square bar to fit standard mortice locks and latches. Great lookers and complete and in good and working order. Backplate 2.5", knob 2.25" and 2.25" front to back. Price is per pair. 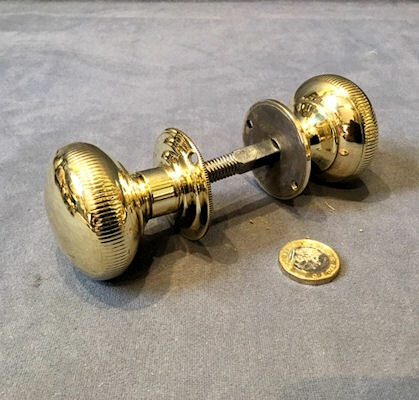 Original, quality pair of 18th or early 19th century spherical shaped brass door knobs with a replacement circular brass backplate and a square section steel bar made to suit. These have been converted to fit both standard rim and mortice locks and latches. These were originally fitted by the blacksmith for each lock and door as required and although we have converted these to fit standard locks and latches, we do need to alter each bar and fitting in length to suit your door and lock measurements. So when ordering these handles, we require the measurement of the thickness of your door and if a rim lock is fitted, the thickness of your lock also. When you receive the handles after our adjustment, it will fit your door and lock precisely. Other pairs, very similar, should be available on request. Complete and in good and working order. Backplates 2" diam, knobs, 2" diam and 2" front to back. Price is per pair. 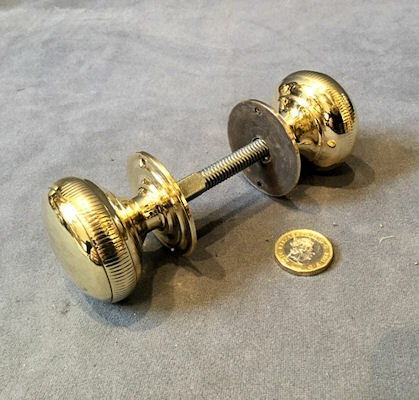 Pair of original, quality 1920's spherical shaped brass door knobs with ribbing to the sides of the knobs, circular backplates and a threaded standard square bar and grub screw adjustment system to fit both mortice and rim locks and latches. The backplates are replacements made to suit and each has two countersunk screw holes for mounting. Complete and in good and working order. Backplate 1.75", knob 1.75" diam and 1.5" front to back. 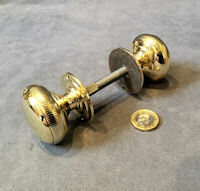 Pair of original, quality 1920's spherical shaped brass door knobs with ribbing to the sides of the knobs, circular backplates and a threaded standard square bar and grub screw adjustment system to fit both mortice and rim locks and latches. Some backplates are replacements made to suit and all have two countersunk screw holes for mounting. Complete and in good and working order. Backplate 1.75", knobs 1.75" diam and 2" front to back. Price is per pair. Original, quality late 19th century unused galvanised exterior door handles with a loose ring to one side and a heavy spherical shaped knob to the other. This example is probably for a stable or large garage doors for the square bar is larger than the standard door lock size. Cleaned and lacquered and complete and in good and working order. Ring 3" exterior diam and boss 1.5" front to back. Knob 2.5" diam and 2.5" front to back. 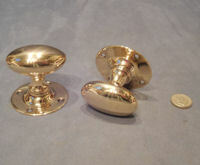 Pair of original, quality pink brass oval shaped door knobs with square backplates circa 1900 / 1920's. 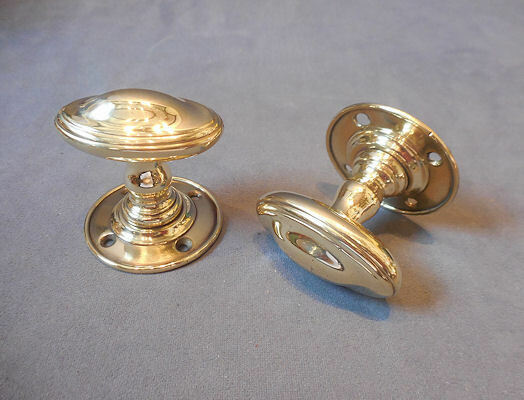 This pair of knobs have heavy cast brass grips with a cushioned top, embossed backplates and a square bar included to fit a standard mortice lock or latch. Each backplate has four countersunk screw holes for mounting and all is complete and in good and working order. Backplates 2.5" x 2.5", knob 2.75" x 1.5" and 2.5" front to back. Price is per pair. 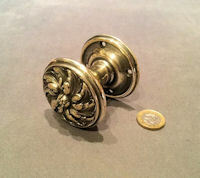 Original, quality pair of late 19th century heavy cast brass door knobs with reeded sides and a bead pattern surrounding a cushioned centre to the front. With a threaded standard square bar and grub screw adjustment system to fit standard mortice locks and latches. 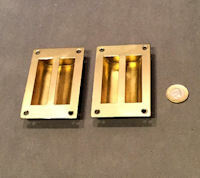 Replacement brass backplates have made to suit, each with three countersunk screw holes for mounting. All is complete and in good and working order. An unusual model. Backplate 2.25", knob 2.25" diam and 2.25" front to back. Original, quality pair of late 19th century decorative cast brass shaped door handles with circular backplates and curved 'T' bar handles with acanthus leaf decoration, with a square bar included to fit a standard mortice locks and latches. A most unusual design and impressed to the reverse with the sun logo and "WT&S" for the manufacturer 'William Tonks & Son of Birmingham'. Complete and in good and working order. Backplate 2" diam, handle 3.5" x 1" and 2.5" front to back. 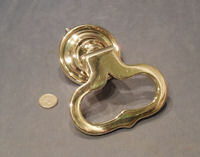 Some matching brass keyholes with covers may well be available ref code: KC444. Price is per pair. Original, quality pair of late 19th century spherical shaped ebony door knobs with the original petal shaped brass backplates and a threaded standard square bar and grub screw adjustment system to fit both mortice and rim locks and latches. Complete and in good and working order. Backplates 2.5", knob 2.25" and 2.5" front to back. Original, quality pair of 1920's oval shaped pink cast brass door knobs with circular backplates and a square bar to fit standard mortice locks and latches. Each backplate has four countersunk screw holes for mounting and all is complete and in good and working order. Backplates 2.5", knob 2.25" x 1.5" and 2.5" front to back. 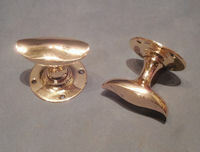 Original, quality pair of oval shaped cast pink brass door knobs with circular brass backplates and a slot and gate adjustment system to fit a standard rim lock and latch. Each backplate has three countersunk screw holes for mounting; one is stamped "Gibbons of Wolverhampton" for the maker and the square bar is stamped "Patented 1909". Complete and in good and working order. Backplates 2", knob 2" x 1.25" and 2" front to back. Original, quality pair of late 19th century spherical shaped, pink brass door knobs with circular backplates and a threaded standard square bar and grub screw adjustment system to fit both mortice and rim locks and latches. Each backplate has four countersunk screw holes for mounting and each knob has a central button to the front in yellow brass. Complete and in good and working order. The first we have seen of this model. Backplates 2.25", knob 1.75" and 2.75" front to back. Original, quality pair of late 19th century ebony door handles with detail to the front and sides, with replacement backplates made to suit copied from an original and a threaded standard square bar and grub screw adjustment system to fit both mortice and rim locks and latches. Each backplate has two concealed countersunk screw holes for mounting and all is complete and in good and working order. An unusual model. Backplate 2", knob 1.75" and 1.75" front to back. Original, quality pair of late 19th century spherical shaped ebony door knobs with replacement circular brass backplates made to suit copied from an original and a threaded both standard square bar and grub screw adjustment system to fit both mortice rim locks and latches. Each backplate has two concealed countersunk screw holes for mounting and all is complete and in good and working order. Backplate 2.25", knob 2.25" and 2" front to back. Original, quality pair of 1920's oval shaped pink brass door knobs with circular backplates and a square bar to fit standard mortice locks and latches. Each backplate has three countersunk screw holes for mounting and all is complete and in good and working order. Backplates 2.3/8", knob 2.25" x 1.5" and 2.5" front to back. 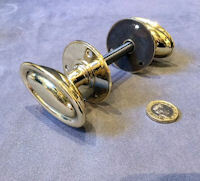 Original, quality pair of 1920's smaller than average pressed brass oval shaped door knobs with a cushion shaped front and replacement circular brass backplates made to suit all with a threaded standard square bar and grub screw adjustment system to fit both mortice and rim locks and latches. Each backplate has three countersunk screw holes for mounting and all is complete and in good and working order. Backplate 2", knob 2.5" x 1.5" and 1.5" front to back. Price is per pair. 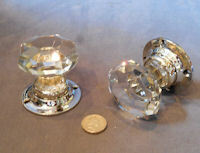 Original, quality pair of 1920's spherical shaped cut clear glass door knobs with circular nickel backplates, each with four countersunk screw holes for mounting. All with a square bar included to fit standard mortice locks and latches. 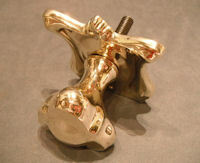 The nickel has been polished and lacquered, although the lacquer may be removed at no extra cost. Some very minor chips to most otherwise complete and in good and working order. Backplates 2.25" diam, knob 2" diam and 2.25" front to back. Price is per pair. Pair of original, quality 1920's, spherical shaped brass door knobs, with a threaded standard square bar and grub screw adjustment system to fit both mortice and rim locks and latches and circular brass backplates, one replacement made to suit, each with two countersunk screw holes for mounting. All is complete and in good and working order. Backplate 1.75", knob 1.75" and 1.75" front to back. Price is per pair. 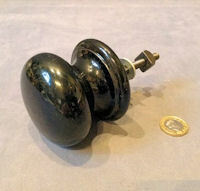 Original, quality pair of late 19th century spherical shaped black ceramic door knobs with circular brass backplates. Each with four countersunk screw holes for mounting. A square bar is included to fit standard mortice locks and latches. Complete and in good and working order. Backplate 2.5", knob 2.25" diam and 2.25" front to back. Price is per pair. 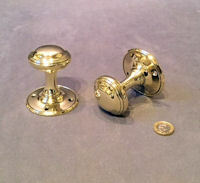 Original, quality pair of circa 1900, spherical shaped brass door knobs with circular backplates and a threaded standard square bar and grub screw adjustment system to fit both mortice and rim locks and latches. One backplate is a replacement made to suit and both have three countersunk screw holes for mounting. A super run in super condition. Complete and in good and working order. Backplate 2" diam and knob 2" diam x 1.75" front to back. Price is per pair. Original, quality pair of late 19th century brass door handles of an unusual design, with a square bar included to fit standard mortice locks and latches. With circular backplates, each with three screw holes for mounting. Complete and in good and working order. Backplates 2.3/8", handle 3" x 1" and 2.25" front to back. Price is per pair. 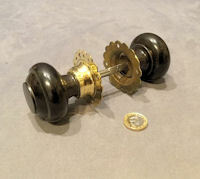 Original, quality late 19th century shaped circular ebony door knobs with a cushioned front and brass shoulders. With a threaded standard square bar and grub screw adjustment system to fit both mortice and rim locks and latches and circular brass backplates, each with three countersunk screw holes for mounting. 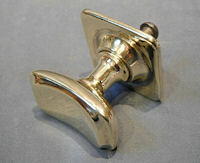 Super quality door handles, complete and in good and working order. Backplate 2.25" diam, knob 2" diam and 2.25" front to back. Price is per pair. 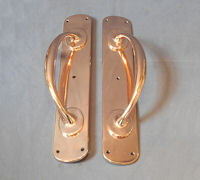 Original, quality, near pair of circa 1900, pink brass lever door handles with circular backplates, one with three countersunk screw holes for mounting and the other with four. 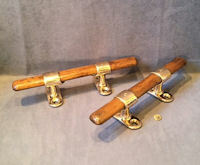 Otherwise, this Arts & Crafts style lever handles are identical and are complete and in good and working order. 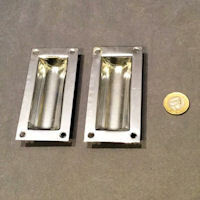 Backplates 2.5" diam, total 4.5" wide and 2.25" front to back. Pair of original, quality six sided ebony door knobs with circular brass backplates circa 1900, with a threaded standard square bar and grub screw adjustment system to fit both mortice and rim lock and latch. Each backplate has four countersunk screw holes for mounting and all is complete and in good and working order. Backplates 2.25", 1.75" knobs diam and 3" front to back. Original, quality circa 1900, spherical shaped ebony door knobs with circular brass backplates, each with four countersunk screw holes for mounting. With a square bar included to fit standard mortice locks and latches. Complete and in good and working order. Backplates 2.25" diam, knobs 2" diam and 3" front to back. 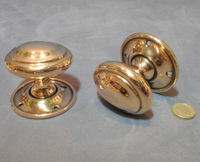 Original, quality pair of 1920's spherical shaped pink brass door knobs with circular backplates. With a square bar included to fit standard mortice locks and latches. Each backplate has three countersunk screw holes for mounting. This pair of knobs are a little smaller than average. Complete and in good and working order. Backplate 2.25", knobs 1.5" and 2.5" front to back. 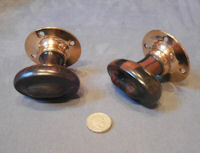 Pair of original, quality circa 1900, turned ebony door knobs. With a threaded standard square bar and grub screw adjustment system to fit both mortice and rim locks and latches and with replacement brass backplates made to suit. Each backplate has three countersunk screw holes for mounting and all is complete and in good and working order. Backplates 2.25" diam, knob 2" diam and 2.75" front to back. Price is per pair. Original, quality near pair of circa 1900, spherical shaped ebony door knobs. With a threaded standard square bar and grub screw adjustment system to fit both mortice and rim locks and latches. This example has replacement brass backplates made to suit, each with three countersunk screw holes for mounting and all is complete and in good and working order. Backplate 2" diam, knob 1.75" diam and 2.75" front to back. Original, quality pair of 1920's spherical shaped pink brass door knobs with square backplates and a square bar included to fit standard mortice locks and latches. Each backplate has four countersunk screw holes for mounting and is complete and in good and working order. Backplates 2" x 2", knob 1.75" diam and 3" front to back. Price is per pair. Original, quality pair of 1920's spherical shaped pink brass door knobs with circular backplates and a threaded standard square bar and grub screw adjustment system to fit both mortice and rim locks and latches. Each backplate has four countersunk screw holes for mounting and all is complete and in good and working order. Backplates 2.5" diam, knobs 1.75" and 2.5" front to back. Price is per pair. 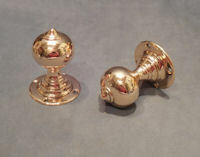 Pair of original, quality 1920's, smaller than average, spherical shaped, cast pink brass door knobs, with a square bar included to fit a standard mortice lock and latch. Each circular backplate has four countersunk screw holes for mounting and all is complete and in good and working order. Backplate 2", knob 1.5 and 2.5" front to back. 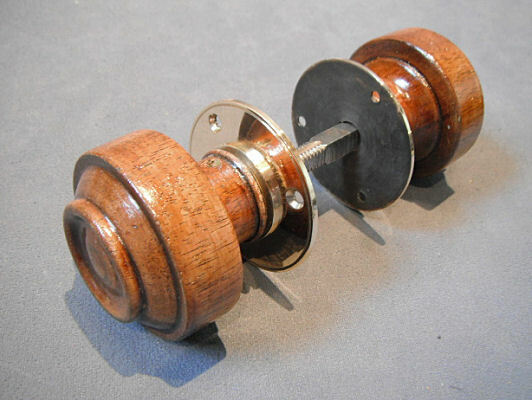 Pair of original, quality, late 19th century, turned light oak door knobs, with a threaded standard square bar and grub screw adjustment system to fit both mortice and rim locks and latches. Replacement brass backplates have been made to suit, each with three countersunk screw holes for mounting. Complete and in good and working order. Backplate 2.25", knob 2" and 2.25" front to back. 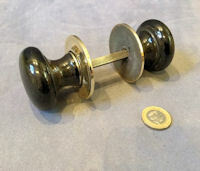 Pair of original, quality, late 19th century, turned ebony door knobs, with a threaded standard square bar and grub screw adjustment system to fit both mortice and rim locks and latches. Replacement brass backplates have been made to suit, each with three countersunk screw holes for mounting. Complete and in good and working order. Backplate 2.25" diameter, knob 2.25" and 2" front to back. Price is for the pair. Pair of original, quality 1920's spherical shaped cast pink brass door handles, with circular backplates and a square bar included to fit a standard mortice lock or latch. Each backplate has five countersunk screw holes for mounting and is stamped to the front with the diamond logo and "Hope" for the manufacturer. The reverse is stamped "Hopes". All has been polished and is complete and in good and working order. Backplate 2.75", knob 1.5" and 2.75" front to back. 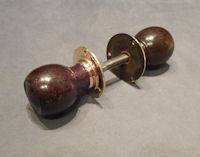 Pair of original, quality mahogany door knobs of a spherical form with flat sides and a threaded standard square bar and grub screw adjustment system to fit both mortice or rim locks and latches. 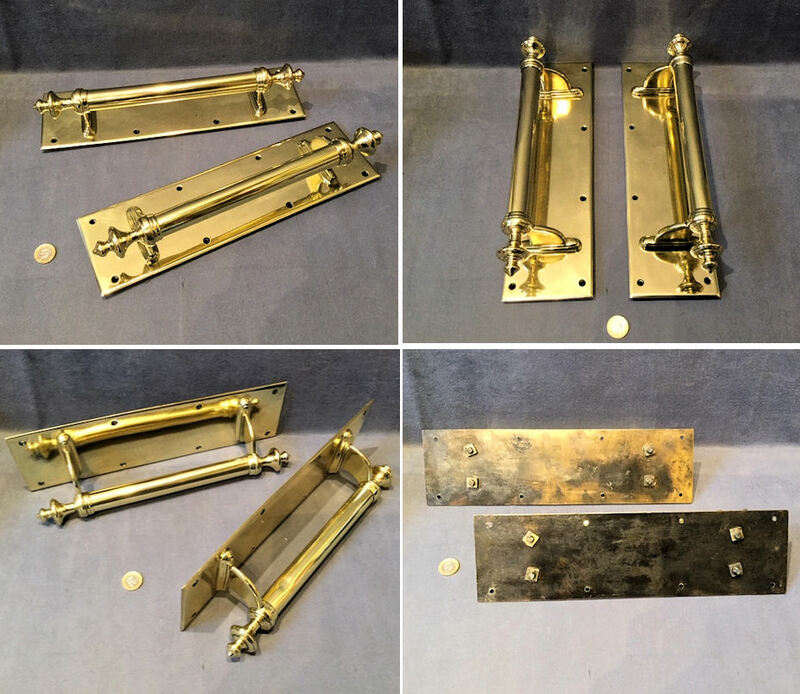 The replacement brass backplates made to suit, each have three countersunk screw holes for mounting and all has been fully overhauled, is complete and in good and working order. Backplate 2.25", knob 2" and 2.25" front to back. 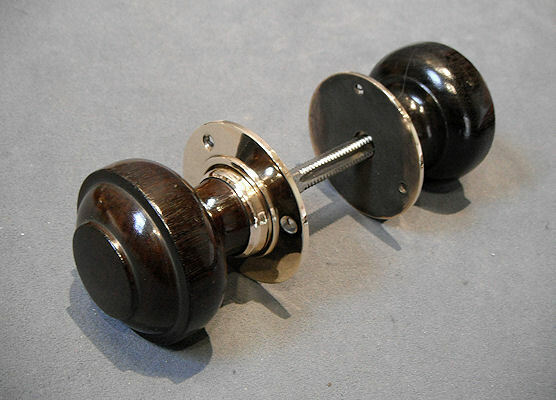 Pair of original, quality mahogany door knobs of a spherical form with flat sides and a design to the front, with a threaded standard square bar and grub screw adjustment system to fit both mortice or rim locks and latches is fitted and replacement brass backplates made to suit. Each backplate has three countersunk screw holes for mounting and all has been fully overhauled, is complete and in good and working order. Backplate 2.25", knob 2" and 2.25" front to back. 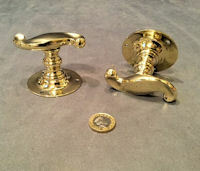 A pair of original, quality, late 19th Century, turned oak door knobs with replacement brass backplates made to suit and a threaded standard square bar and grub screw adjustment system to fit both mortice or rim locks and latches. Each backplate has three countersunk screw holes for mounting and all is complete and in good and working order. A run of superb oak door handles. Backplate 2.25", knob 2.25" and 2.25" front to back. 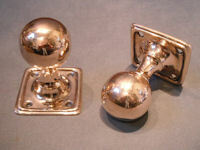 A pair of original, quality, 1920's, spherical shaped, pink brass door knobs with circular backplates, each with three countersunk screw holes for mounting, and with a square bar included to fit a standard mortice lock or latch. Complete and in good and working order. Backplate 2.25" diameter, knob 1.5" diameter and 2.75" front to back. Price is per pair. 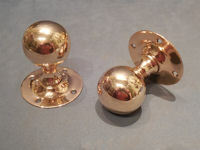 A pair of original, quality, 1920's, spherical shaped, cast pink brass door handles with circular backplates, each with three countersunk screw holes for mounting. A square bar is included, to fit a standard mortice lock or latch and all is complete and in good order. Backplate 2" diameter, knob 1.75" diameter and 2.75" front to back. 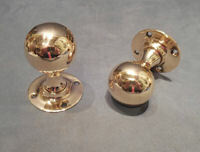 A pair of original, quality 1920's, cast pink brass, spherical shaped door knobs with a threaded standard square bar and grub screw adjustment system to fit both mortice or rim locks and latches and with circular, brass backplates, each with three countersunk screw holes for mounting. Complete and in good and working order. Backplate 2", knob 1.5" and 3" front to back. Price is per pair. 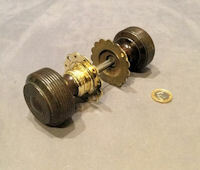 A pair of original, quality, late 19th Century, ribbed ebony door knobs with a standard threaded square bar and grub screw adjustment system to fit both mortice or rim locks and latches and with replacement brass backplates made to suit, each with two countersunk screw holes for mounting. 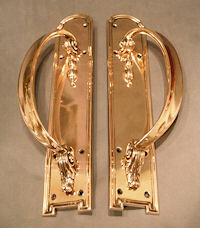 Super quality door handles; complete and in good and working order. Backplate 2.5", knob 2" and 3.25" front to back. 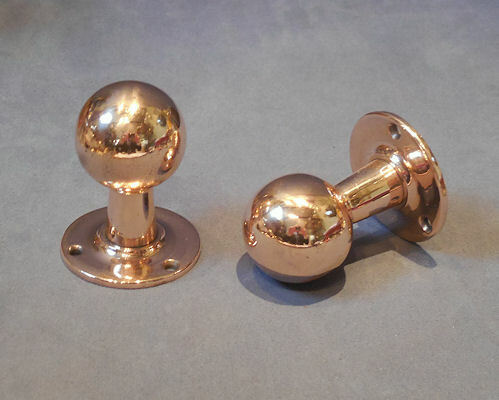 A pair of original, quality, 1920's, spherical shaped, cast pink brass door knobs with a square bar included to fit a standard mortice lock or latch and circular backplates, each with four countersunk screw holes for mounting. Complete and in good and working order. Backplate 2.5", knob 1.75" and 3.25" front to back. 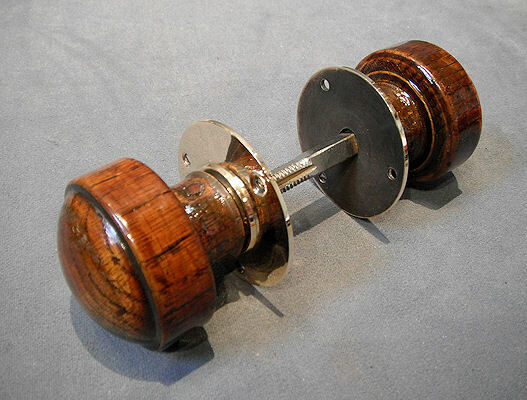 A pair of original, quality, late 19th Century, turned, light oak door knobs, with a threaded standard square bar and grub screw adjustment system, to fit both mortice or rim locks and latches. Fitted with replacement brass backplates made to suit, each with three countersunk screw holes for mounting. All are complete and in good and working order. Backplate 2.25" diameter, knob 2.25" diameter and 2.75" front to back. Price is per pair. 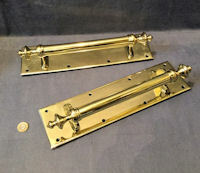 A pair of original, quality, 18th or early 19th century, cast brass, drop ring door handles, fitted with replacement brass backplates and a square steel bar, made to suit. These have been converted to fit both standard rim and mortice locks and latches. These handles were originally fitted by the blacksmith for each lock and door as required and, although we have converted these to fit standard locks and latches, we need to alter each bar and fitting in length to suit your door and lock measurements. So when ordering these handles, we require the measurements of the thickness of your door and, if a rim lock is fitted, the thickness of your lock also. When you receive the handles after our adjustment, it will fit your door and lock precisely. Other pairs of similar door handles should be available upon request. Backplate 1.75", handle 2" to 2.5" wide, 2" drop approx and 0.75" to 1" front to back. Price is per pair, including the adjustment to your door size. 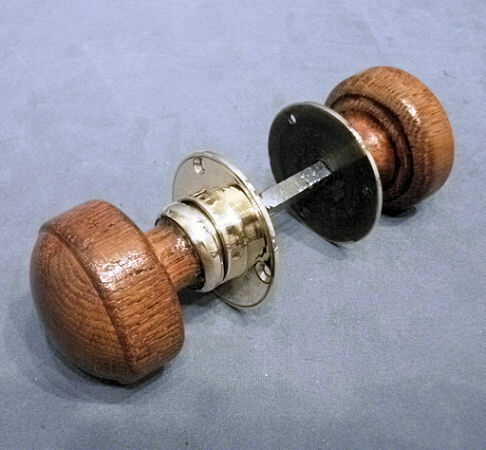 A pair of original, quality, 1920's, turned and stained beech door knobs, with a threaded, standard square bar and grub screw adjustment system, to fit both mortice or rim locks and latches, and replacement brass backplates, made to suit. Each backplate has three countersunk screw holes for mounting and all is complete and in good and working order. Backplate 2.25" diameter, knob 2" diameter and 2" front to back. 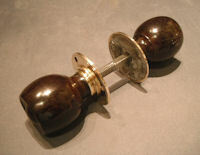 A pair of original, quality, turned ebony door knobs, circa 1900. They have a threaded standard square bar and grub screw adjustment system to fit both standard mortice or rim locks and latches and replacement brass backplates made to suit, each with three countersunk screw holes for mounting. A super pair of handles with just an extra detail to the face of each knob. All is complete and in good and working order. Backplate 2", knob 2" and 2.75" front to back. Original, quality pair of spherical shaped, circa 1900, door knobs with a square bar to fit standard mortice locks and latches. These examples have long slender necks, cushioned knobs and circular backplate with four countersunk screw holes for mounting. An unusual shape. Complete and in good and working order. Backplates 2.75", knob 2" and 3" front to back. Price is per pair. Original, quality pair of 1920's spherical shaped clear cut and polished glass door knobs with circular aluminium backplates each with four countersunk screw holes for mounting and a square bar included to fit standard mortice locks and latches. 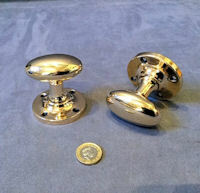 These super pair of knobs are perfect, with not a chip in sight and complete and in good and working order. Backplate 2.25", knob 2.25" and 2.25" front to back. Original, quality 1920's single oval shaped cut glass door knob on the original brass backplate with three countersunk screw holes for mounting. The reverse is stamped for the manufacturer "Comyn Ching London". Not a chip in sight and complete and in good and working order. Backplate 2.25", knob 2.5" x 1.5" and 2.5" front to back. Original, quality circa 1900, pair of oval shaped pink cast brass door knobs with square backplates and a square bar included to fit standard mortice locks and latches. Each backplate has four countersunk screw holes for mounting and a raised outer rim and the knobs have a raised cushioned top. Complete and in good and working order. Backplate 2.5" square, knob 2.5" x 1.5" and 2.75" front to back. Pair of 1920's oval shaped brass door knobs with embossed Art Nouveau designs and square backplates with a similar detail and a square bar included to fit a standard mortice lock or latch. Each backplate has four screw holes for mounting and all is complete and in good and working order. Backplates 2.25" square, knob 2.75" x 1.5" and 2.5" front to back. Price is per pair. Original, quality pair of 1920's oval shaped cast pink brass door knobs, with a threaded standard square bar and plate adjustment to fit standard rim lock or latch. The circular backplate has four countersunk screw holes for mounting and all is complete and in good and working order. Backplate 2.5" diam, knob 2.25" x 1.5" and 2.25" front to back. Price is for the pair. 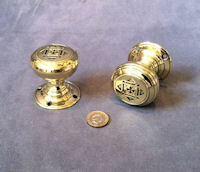 Original quality pair of 1920's/30's spherical shaped brass door knobs with circular backplates. A square bar is included to fit standard mortice locks and latches. Each backplate has three countersunk screw holes for mounting and all is complete and in good and working order. Backplate 2.25" diameter, knob 1.75" and 2.75" front to back. Price is per pair. 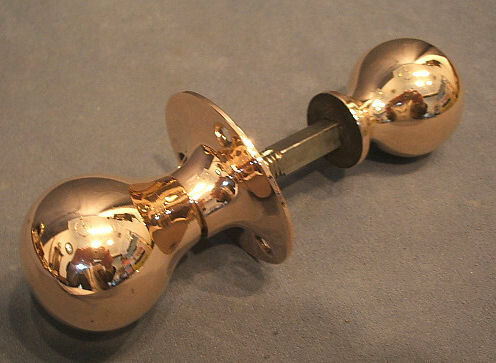 Original, quality late 19th century spherical shaped brass door knob with a smaller cranked brass turning knob and a standard square bar to fit a thin surface mounted door lock. Most unusual to find these and this example appears unused. Complete and in good and working order. Knob 2" diam and 1.75" front to back. 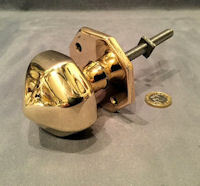 Cranked handle 2.5" x 1" and small knob 1.25" diam. 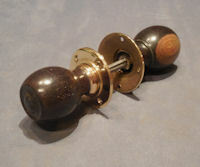 Original, quality pair of late 19th century ribbed ebony door knobs, with petal shaped cast brass backplates and a threaded standard square bar and grub screw adjustment system to fit both mortice and rim locks and latches. Each backplate has four countersunk screw holes for mounting, the knobs are of an unusual shape and all is complete and in good and working order. Backplates 2.5", knob 1.75" and 3.25" front to back. Original, quality late 19th century superb pair of cast pink brass door knobs in the well detailed form of poppy seed pods in the Art and Crafts manner. The backplates have a milled edge and concealed countersunk screw holes for mounting and a threaded standard square bar and grub screw adjustment system to fit standard mortice locks and latches. 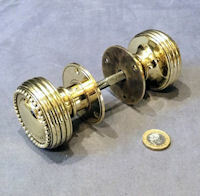 This is the first pair we have seen of this model, and I was informed this pair of knobs came from either Hampton Court Palace or Buckingham Palace. Backplate 2", knob 2" and 2.75" front to back. Original, quality pair of superb late 19th century nickel plated spherical shaped door knobs with well detailed designs of radiating acanthus leaves around a central seed pod head. The circular backplates again have embossed radiating acanthus leaf tips and four concealed countersunk screw holes for mounting and a square bar is included to fit a standard mortice locks and latches. Complete and in good and working order. Backplate 2.5", knob 2.5" and 3" front to back. Original, quality late 19th century spherical shaped nickel plated door knob with a well detailed design of radiating acanthus leaves around a central seed pod head. The plain tapered neck is mounted on a circular backplate with four countersunk screw holes. A super but single door knob. Complete and in good and working order. Backplate 2.25", knob 2.25" and 2.5" front to back. 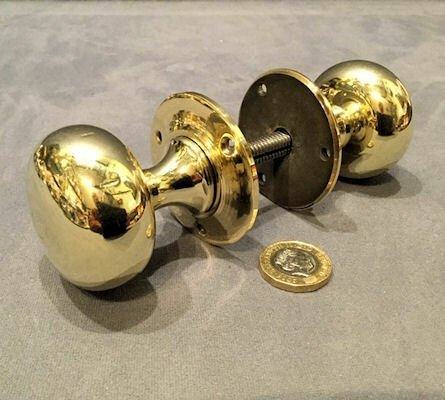 Original, quality pair of late 19th cenutry heavy cast brass oval shaped door knobs, with replacement brass backplates made to suit and a threaded standard square bar and grub screw adjustment system to fit both mortice and rim locks and latches. Each backplate has three countersunk screw holes for mounting and the handles have a deep relief detail of a horn of plenty to the upper half, a plain lower half and a good proportioned shaped neck. A fantastic pair of door handles, the first we have seen. Complete and in good and working order. Backplates 2.25" , knob 2.5" x 1.75" and 2.75" front to back. Original, quality late 19th century spherical shaped, flat fronted door knobs with a pierced decorative panel to the front. The backplates have a shaped outer edge and four concealed countersunk screw holes for mounting. Detailed to the reverse of the backplates "Gibbons patent" and "White and Sons 207 Oxford St". All is complete and in good and working order and most unusual. Backplate 2.25", knob 2.25" and 2.25" front to back. 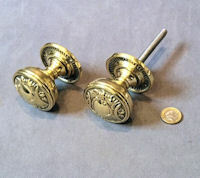 Original, quality pair of circa 1900, oval shaped cast pink brass door knobs with cushioned fronts and circular backplates, each with three countersunk screw holes for mounting and a threaded standard square bar and grub screw adjustment system to fit both mortice and rim locks and latches. One replacement backplate has been made to suit All is complete and in good and working order. Backplate 2.25", knob 2.25" x 1.75" and 2.5" front to back. 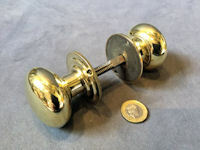 Original, quality pair of late 19th century spherical shaped brass door knobs with flat fronts with a blind fret design and a small cross to the centre, similar to a Maltese cross. This most unusual pair have circular backplates, each with four countersunk screw holes for mounting and a square bar is included to fit standard mortice locks and latches. Complete and in good and working order. Backplate 2", knob 2" and 2.25" front to back. 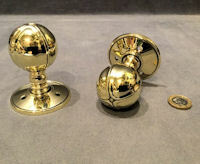 Original, quality pair of late 19th century spherical shaped brass door knobs with a central embossed button to the fronts, circular backplates and a threaded bar and plate adjustment system to fit both mortice and rim locks. Each backplate has three countersunk screw holes for mounting and all is complete and in good and working order. Backplate 2" diam, knob 1.5" diam and 2.75" front to back. 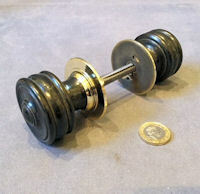 Original, quality pair of late 19th century turned ebony handles, a little larger than average and spherical in shape with circular ribbing to the front. 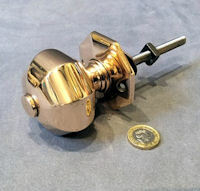 This example with a threaded standard square bar and grub screw adjustment system to fit both mortice and rim locks and latches has replacement brass backplates made to suit, each with three countersunk screw holes for mounting. All is complete and in good and working order. Backplate 2.25" diam, knob 2" diam and 3.25" front to back. 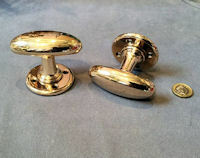 Original, quality pair of late 19th century brass door knobs with circular backplates and a threaded square bar with a plate adjustment to fit standard rim or mortice locks and latches. These examples have a deep embossed design of Acanthus leaves and all is complete and in good and working order. 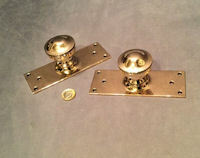 Matching brass fingerplates may well be available ref code FP221. Backplate 2.25", knob 2.25" and 2.5" front to back. 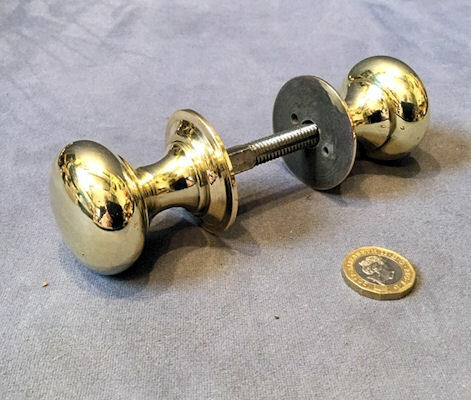 Original, quality pair of 18th or early 19th century spherical shaped brass door knobs with a replacement circular brass backplate and a square section steel bar made to suit. These have been converted to fit both standard rim and mortice locks and latches. These were originally fitted by the blacksmith for each lock and door as required and although we have converted these to fit standard locks and latches, we do need to alter each bar and fitting in length to suit your door and lock measurements. So when ordering these handles, we require the measurement of the thickness of your door and if a rim lock is fitted, the thickness of your lock also. When you receive the handles after our adjustment, it will fit your door and lock precisely. Other pairs, very similar, should be available on request. Complete and in good and working order. Backplate 1.5", knob 1.5 diam and 1.25" front to back. Original, quality pair of late 19th century oval shaped cast pink brass door knobs of a good weight and size with circular backplates. A square bar is included to fit standard mortice locks and latches. Each backplate has four countersunk screw holes for mounting and all is complete and in good and working order. Backplates 2.25", knob 3.25" x 1.25" and 2.5" front to back. Original, quality pair of late 19th century cast pink brass circular door knobs with cushioned tops with a bead to the outer rim and rectangular backplates. Each backplate has six countersunk screw holes for mounting and a square bar is included to fit standard mortice locks and latches. Complete and in good and working order. Backplate 6" x 2.25", knob 2" diam and 2.25" front to back. Original, quality pair of late 19th century spherical shaped ebony door knobs with plain but large pink brass circular backplates and a square bar included to fit standard mortice locks and latches. Each backplate has three countersunk screw holes for mounting and all is complete and in good and working order. Backplate 3.25" diam, knob 2.25" diam and 2.5" front to back. 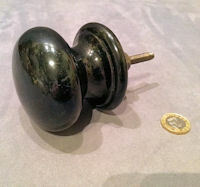 Another very similar pair of door knobs with colour variation to the ebony may well be available, code DH586. Original, quality, circa 1900, pair of oval shaped cast pink brass door knobs with square/rectangular backplates, and a square bar included to fit standard mortice locks and latches and each backplate has four countersunk screw holes for mounting. The knobs are oval shaped with flat backs and originally had longer backplates trimmed, otherwise now complete and in good and working order. Backplate 2" x 2.5", knob 2.75" x 1.25" and 2.5" front to back. Price is per pair. 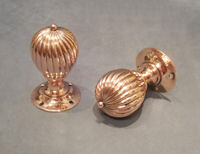 Original, quality, pair of circa 1900, cast pink brass spherical shaped door knobs on rectangular backplates each with four countersunk screw holes for mounting, and a square bar included to fit standard mortice locks and latches. The flattened knobs have circular ribbing, the backplates have horizontal ribs to the top and bottom, and the reverse is impressed for the manufacturer "Gibbons Wolverhampton". All are complete and in good and working order. Backplates 5.75" x 2", knob 2" diam and 2.5" front to back. Price is per pair. 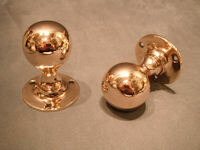 Original, quality circa 1990pair of smaller than normal spherical shaped cast pink brass door knobs with long tapered necks and square backplates. Each backplate has four countersunk screw holes for mounting and a square bar is included to fit standard mortice locks and latches. The reverse is impressed "Gibbons Wolverhampton" for the manufacturer. Complete and in good and working order. Backplate 2" x 2", knob 1.25" diam and 2.75" front to back. Original, quality pair of cast pink brass oval shaped door knobs circa 1900 with circular backplates. Each backplate has four countersunk screw holes for mounting and a square bar is included to fit standard mortice locks and latches. 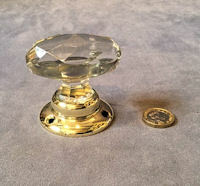 These super door knobs are larger than average and are complete and in good and working order. Backplate 2.75", knob 2.5" x 2" and 2.25" front to back. Original, quality pair of ribbed late 19th century spherical shaped ebony door knobs with flat and ribbed sides and circular brass ribbed backplates. The backplates are replacements made to suit and each has three countersunk screw holes for mounting. This example has a threaded standard square bar and grub screw adjustment system to fit both mortice and rim locks and latches. All is complete and in good and working order. Backplates 2.25" diam, knob 2" diam and 2.25" front to back. Pair of original, quality late 19th century brown ceramic spherical shaped door knobs with cast iron backplates and mounts and a standard square bar to fit mortice and rim locks. The backplates are replacements made to suit, and each has three countersunk screw holes for mounting. 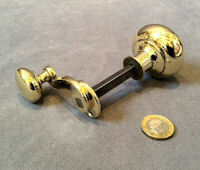 These knobs are not adjustable, but we can alter the length of the bar to suit your door and lock for no extra cost. The iron work has been cleaned and lacquered, and all is complete and in good and working order. Backplates 2" diam, knobs 2.25" diam and 2" front to back. 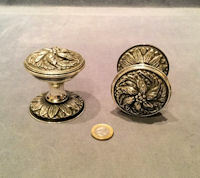 Original, quality larger than average cast brass door knobs in the original, bronzed finish in a serious Arts and Crafts seed pod and leaves form, circa 1900. These super examples are for use with mortice locks and latches and have five countersunk screw holes to each backplate and a square bar for turning. No maker's marks but we think these were manufacturer by Dryad of Leicester. Complete and in good and working order. Backplate 4" diam, knob 2.5" diam and 3" front to back. Price is per pair. 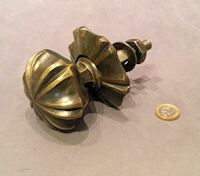 Original, quality pair of cast pink brass egg shaped door knobs circa 1900, in a serious Arts and Crafts form. These examples, for use with mortice, lock have a square backplate with soft corner and four screw holes for mounting and plant seed pod shaped knobs. No maker's marks but we think these were manufactured by Dryad of Leicester. A superb pair of handles with a square steel bar included. Backplate 2.5" square, knob 1.5" diam and 3" front to back. 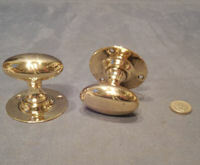 Original, quality near pair 1920's oval shaped brass door knobs with circular brass backplates, each with four countersunk screw holes for mounting. A square bar is included to fit standard mortice locks and latches and all is complete and in good and working order. Backplate 2.5" diam, knob 2.5" x 1.5" and 2.25" front to back. Pair of original, quality 1920's oval shaped brass door knobs with circular brass backplates, each with three countersunk screw holes for mounting. A square bar is included to fit standard mortice locks and latches and all is complete and in good and working order. Backplate 2.5" diam, knob 2.25" x 1.25" and 2.25" front to back. 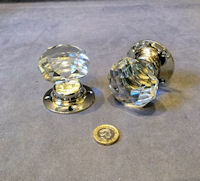 Pair of original, quality 1920's / 30's spherical shaped cut glass door knobs, with circular nickel backplates each with four countersunk screw holes for mounting. These super knobs, with a square bar included to fit standard mortice locks and latche, have a few very very minor chips but otherwise are complete and in good and working order. Backplate 2.25", knob 2.25" and front to back 2.5". Original, quality pair of 1920's oval shaped copper door knobs, with square backplate and a square bar included to fit standard mortice locks and latches. These super examples have a serious art nouveau embossed design of stylised poppy seed pods and much of the original bronzed finish. The backplates each have four screw holes for mounting and a further single handle may well be available. All are complete and in good and working order. Backplate 2.5" square, knob 2.75" x 1.5" and 2" front to back. 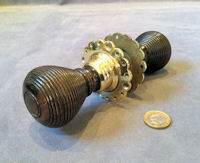 Original, quality pair of late 19th century spherical shaped door knobs in walnut, with a cushioned front, ribbed sides and petal shaped brass backplates, each backplate has two screw holes for mounting. A square bar is included to fit standard mortice locks and latches. 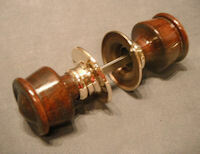 Although these knobs are a true pair, the colour of the wood varies considerably with one much darker than the other. Otherwise all is complete and in good and working order. Backplates 2.25" diam, knob 2.25" diam and 2.25" front to back. Original, quality pair of late 19th century, cast pink brass door handles of the ' T ' bar form, with a threaded standard square bar and grub screw adjustment system to fit both mortice and rim locks and latches. The pink cast brass circular backplates each have three concealed countersunk screw holes for mounting. These handles were probably from a greenhouse / conservatory door originally, but are most suitable for standard household doors also. All is complete and in good and working order. Backplates 2" diam, handle 3.25" wide and 2" front to back. 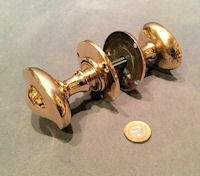 Original, quality pair of most unusual rectangular shaped brass door knobs with shaped necks and square backplates, each with four screw holes for mounting. 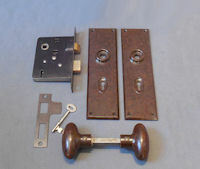 A square bar is included to fit standard mortice locks and latches and the backplates are stamped to the reverse with the registration number for the year 1904. All is complete and in good and working order. Backplate 2" square. Knob 2.25" x 1.5" and 2.5" front to back. Pair of original quality, 1920's, pink cast brass door handles with a circular backplate with three countersunk screw holes for mounting and a threaded standard square bar and grub screw adjustment for standard rim locks and latches. Backplate 2.25", knob 1.25" and 2.5" front to back. Pair of original, quality, late 19th century, Art Nouveau cast pink brass oval shaped door knobs, with a square bar included to fit a standard mortice lock and latch and circular backplates each with four countersunk screw holes for mounting. 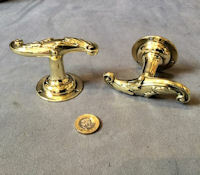 These knobs with a most unusual Art Nouveau style to the handle are impressed to the reverse "M.B.B" for the manufacturer and are complete and in good and working order. Backplate 2.75", knob 3" x 1.5" + 2.75" front to back. Pair of original, quality, late 19th century, oval shaped larger than average brass door knobs with a deep diagonal ribbing and matching circular backplates and with a square bar included to fit a standard mortice lock and latch. Each backplate has three screw holes for mounting and all is complete and in good and working order. Backplate 2.5", knob 3" x 1.75" + 3.25" front to back. 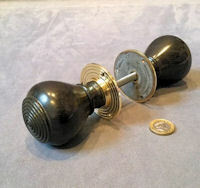 Pair of original, quality 1920's, spherical shaped ebony door knobs, with a threaded standard square bar and grub screw adjustment system to fit both mortice and rim locks and latches. Replacement brass backplates have been made to suit, each with four countersunk screw holes for mounting. Backplate 2.25", knob 1.75" + 2.5" front to back. Price is for the pair. Other similar knobs may well be available within this section. Pair of original, quality 1920's, spherical shaped pink brass door knobs with circular backplates, each with three countersunk screw holes for mounting, with a square bar included to fit a standard mortice lock and latch. The reverse is impressed for the manufacturer "Dryad of Leicester". Complete and in good and working order. Backplate 2.25" diameter x 1.5" + 3" front to back. 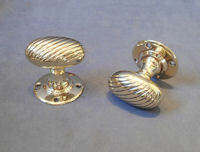 Pair of original, quality, late 19th century, egg shaped swirled and diagonal reeded door knobs in pink brass with circular backplates, each with four countersunk screw holes for mounting and with a square bar included to fit a standard mortice lock and latch. These heavy examples are unusual and have a dimpled ball to the centre of the nose. Complete and in good order. Backplate 2.25" diameter, knob 2" diameter + 3.5" front to back. Pair of original, quality, late 19th century, spherical shaped cast pink brass door knobs with circular backplates and a square bar included to fit a standard mortice lock and latch. Each backplate has four countersunk screw holes for mounting and the smaller than average knobs have a central soft point. Complete and in good and working order. Backplate 2.25", knob 1.5" diameter + 3" front to back. Pair of original, quality 1920's, spherical shaped cast pink brass door knobs, with a square bar included to fit a standard mortice lock and latch. The circular backplates each have four countersunk screw holes for mounting and all is complete and in good and working order. Backplate 2.5", knob 1.5" diameter + 2.75" front to back. 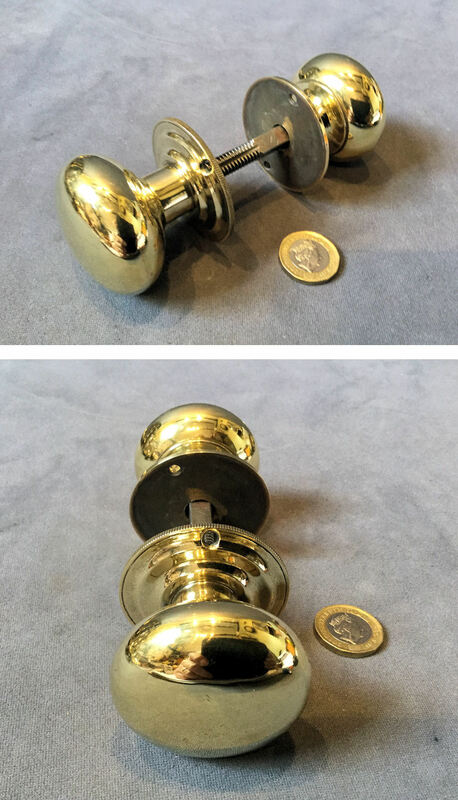 Pair of original, quality, late 19th century, oval shaped brass door knobs with circular backplates and a square bar included to fit a standard mortice lock and latch. Each backplate has four countersunk screw holes for mounting and the knobs are diagonally ribbed. A most unusual style of door knob. Polished and lacquered, complete and in good and working order. Backplate 2.25" diameter, knob 2.5" x 1.5", 2.5" front to back. Pair of original, quality 1920's, spherical shaped cast pink brass door knobs with circular backplates, each with three counterrsunk screw holes for mounting. This pair of handles has a square bar included to fit a standard mortice lock and latch and are complete and in good and working order. Backplate 2.5" diameter, knob 1.5" + 3" front to back. Pair of original, quality 1920's, egg shaped, brass door knobs with replacement circular brass backplates made to suit and a threaded standard square bar and grub screw adjustment system to fit both mortice and rim locks and latches. Each backplate has three countersunk screw holes for mounting. This example is most unusual in brass and normally found in ebony. All are complete an in good and working order. Backplate 2" diameter, knob 1.75" diameter + 3" front to back. 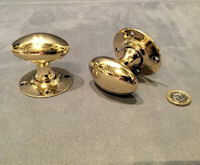 Pair of original, quality, oval shaped brass door knobs, circa 1900, with a square bar included to fit a standard mortice lock and latch and circular brass backplates each with four countersunk screw holes for mounting. These examples have a cushioned top to the knob and a waisted form on the neck and are complete and in good and working order. Backplate 2.25" diameter, knob 2.25" x 1.25" + 2.5" front to back. Pair of original, quality 1920's, spherical shaped cast pink brass door knobs, with a square bar included to fit a standard mortice lock and latch. Each circular backplate has four countersunk screw holes for mounting and all is complete and in good and working order. Backplate 2.5", knob 1.75" diameter + 3" front to back. Pair of original, quality, most unusual oval shaped ebony door knobs with circular cast pink brass backplates, circa 1900, with a square bar included to fit a standard mortice lock and latch. Each backplate has four countersunk screw holes for mounting. These examples have a super variation in colour with brown sections on black. Complete and in good and working order. A great run of knobs. Backplate 2.5" diameter, knobs 2.5" x 1.5" + 2.5" front to back. Price is per pair. Pair of original, quality, late 19th century, oval shaped pink brass door knobs, with a square bar included to fit a standard mortice lock and latch. Each backplate has a reeded outer rim, three countersunk screw holes for mounting and the knob has a cushioned top and reeded outer edges. A super quality pair of handles. Complete and in good and working order. Backplate 2.75" diameter, knob 2.5" x 1.75" + 2.25" front to back. Price for the pair. Pair of original, quality 1920's, spherical shaped ebony door knobs with a recessed dimple to the face, replacement brass backplates made to suit and a threaded standard square bar and grub screw adjustment system to fit both mortice and rim locks and latches. Each backplate has three countersunk screw holes for mounting and all is complete and in good and working order. Backplates 2" diameter, knob 1.75" diameter + 2.5" front to back. Price is per pair. Original, quality circa 1900, pair of spherical shaped ebony door knobs. With a threaded standard square bar and grub screw adjustment system to fit both mortice and rim locks and latches and replacement brass backplates made to suit. Each circular backplate has three countersunk screw holes for mounting and all is complete and in good and working order. Backplate 2.25", knob 1.75" and 2.5" front to back. Price is per pair. Pair of original, quality, late 19th century, spherical shaped brass door knobs with flat fronts, circular backplates which have concealed fittings so, when mounted, no screws are visible and a square bar included to fit a standard mortice lock and latch. The backplates are reeded and the face of the knobs are detailed with small bullseye designs overall divided by wavy diagonal lines. All have been polished and are complete and in good and working order. Backplate 2.25" diameter, knob 2" + 2.25" front to back. 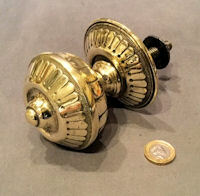 Pair of original, quality 1920's, spherical shaped brass door knobs with circular backplates, each with four countersunk screw holes for mounting and a square bar included to fit a standard mortice lock and latch. Complete and in good and working order. Backplate 2.25" diameter, knob 1.75" + 3" front to back. 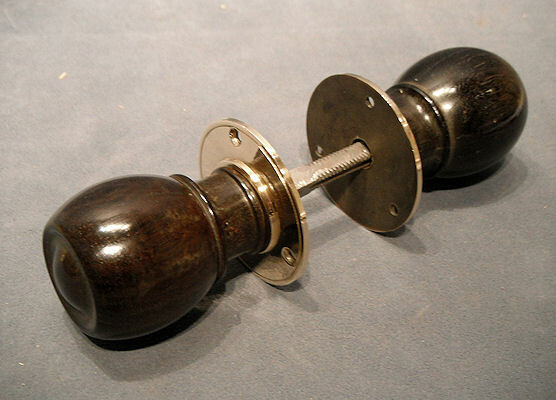 Pair of original, quality, late 19th century, larger than average spherical shaped ebony door knobs, with brass backplates and a threaded standard square bar and grub screw adjustment system to fit standard mortice locks and latches. These superb handles have large decorative thick sheet brass backplates, each with eight countersunk screw holes for mounting. Fully overhauled and complete and in good and working order. The first we have seen of this model. Backplate 4.5" widest, knob 2.5" diameter + 3" front to back. 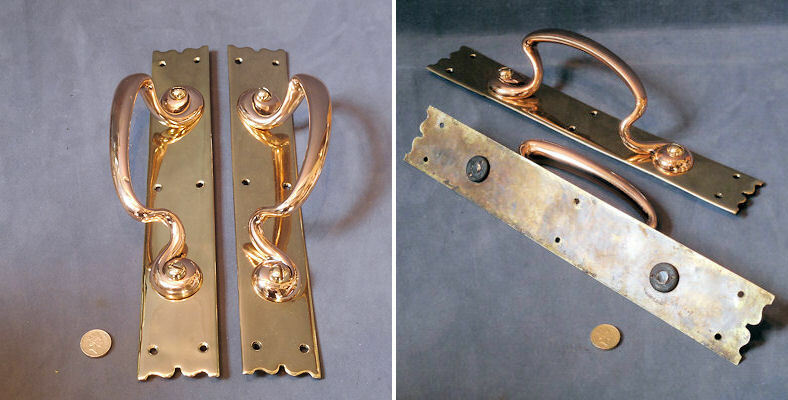 Pair of original, quality 1920's, cast pink brass lever door handles, with flowing and curved levers on square backplates with soft corners, an edge bead and four countersunk screw holes to each for mounting and a square bar included to fit a standard mortice lock and latch. Polished and complete and in good and working order. Backplates 2.25" x 2.25", total 5" wide + 2" front to back. 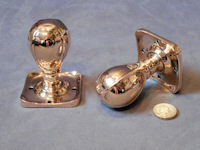 Pair of original, quality 1920's, spherical shaped pink brass door knobs, with square backplates and a square bar included to fit a standard mortice lock and latch. Each backplate has four countersunk screw holes form mounting and a bead to the edge. Complete and in good and working order. Backplate 2.25" square, knob 1.75", 3" front to back. 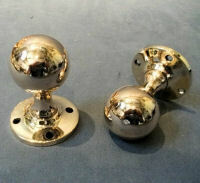 Pair of original, quality 1920's, cast pink brass spherical shaped door knobs, with standard square bar to fit standard mortice locks and latches and circular backplates, each with three countsunk screw holes for mounting. Complete and in good and working order. Backplate 2.25" diameter, knob 1.75" diameter + 3" front to back. 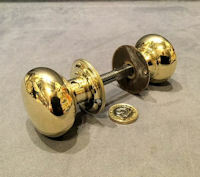 Pair of original, quality 1920's, spherical shaped brass door knobs, with a threaded standard square bar and grub screw adjustment system to fit both mortice and rim locks and latches. Replacement brass backplates made to suit, each with two countersunk screw holes for mounting. All is complete and in good and working order. Backplate 1.75" knob 1.75" and 1.75" front to back. Price is per pair. 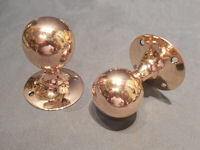 Pair of original, quality 1920's, spherical shaped cast pink brass knobs with square backplates, each with four countersunk screw holes for mounting. A square bar is included to fit a standard mortice lock and latch. 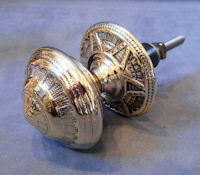 These most unusual door knobs have a Maltese cross to the top of each knob. All are complete and in good and working order. Backplate 2.25" x 2.25", knob 2" diameter + 2.75" front to back. Price is per pair. A matching single knob is also available. 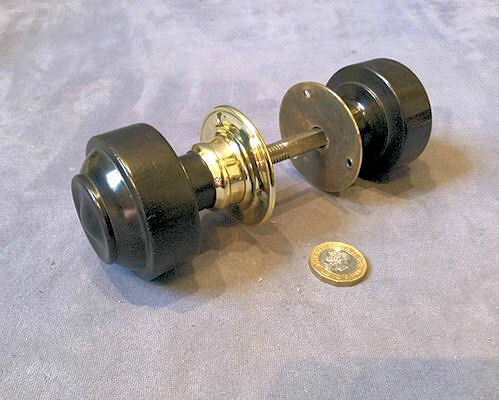 Pair of original, quality 1920's, spherical shaped, ebony door knobs, a little larger than normally found, with a threaded standard square bar and grub screw adjustment system to fit both mortice and rim locks and latches. Replacement brass backplates have been made to suit and each has three countersunk screw holes for mounting. All are complete and in good and working order. Backplates 2.25" diameter, knobs 2" and 2.5" front to back. Price is per pair. Other very similar, but smaller, knobs may well be available within this section. 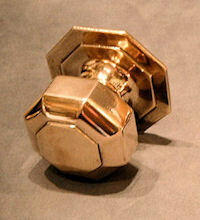 Pair of original, quality, spherical shaped cast brass door knobs, circa 1920's. Only suitable for a mortice latch / lock. The reverse is impressed for the manufacturer "Ashworth and Keen's" and "Patent No. 6256". These handles will operate by depressing the press button to the underside which will move the central rod and thus lifting the mortice latch / lock. Most unusual, each backplate has four screw holes for mounting and all is complete and in good and working order. Backplate 2.5" diameter, knob 1.75" diameter and 3" front to back. Pair of original, quality, late 19th century, oval shaped copper door knobs, with a square bar included to fit a standard mortice lock and latch. The backplates have concealed fittings so when mounted, no screws are visible. 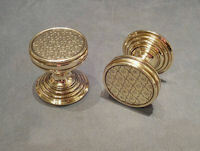 These examples have an embossed and engraved pattern to the face and a reeded outer rim of the knob. Complete and in good order. Backplate 2.25" x 1.75, knob 2.25" x 1.75" and 2" front to back. 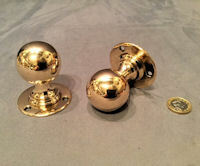 Pair of original, quality, pink brass door knobs, with a slot and gate adjustment system for rim locks only. This pair is unusual in having a different knob to each side. The bar is impressed with the patent number for the year 1909 and the backplate for the manufacturer "Gibbons of Wolverhampton". Complete and in good and working order. Backplate 2" diameter, knobs 1.75" and 1.5" diameter, both 2.25" front to back. Price is per pair. Pair of original, quality 1920's, spherical shaped pink brass door knobs, with a square bar included to fit a standard mortice lock and latch. The circular backplates each have three countersunk screw holes for mounting. Complete and in good and working order. Backplate 2.25" diameter, knob 1.75" and 3" front to back. 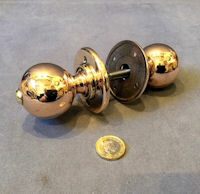 Pair of original, quality 1920's, smaller than average, spherical shaped pink brass door knobs, with a square bar included to fit a standard mortice lock and latch. The circular backplates each have three countersunk screw holes for mounting. 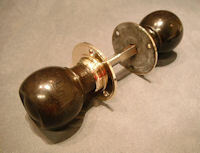 A pair of super, plain but delicate door knobs, complete and in good and working order. Backplate 2", knob 1.25" and 2.5" front to back. Price is per pair. Pair of original, quality, pink brass door knobs, circa 1900, of an unusual design and with a threaded standard square bar and grub screw adjustment system to fit both mortice and rim locks and latches. The circular brass backplates each have four countersunk screw holes for mounting and are impressed for the manufacturer "Gibbons of Wolverhampton". Complete and in good and working order. Backplate 2" diameter, knob 1.75" and 2.25" front to back. Pair of original, quality 1920's, spherical shaped, pink brass door knobs, with a square bar included to fit a standard mortice lock or latch. The circular backplates each have three countersunk screw holes for mounting and all is complete and in good and working order. Backplate 2.25" diameter and knob 1.75" and 3" front to back. Pair of orignal, quality 1920's, small spherical shaped pink brass door knobs, with a square bar included to fit a standard mortice lock and latch. The circular backplates each have two countersunk screw holes for mounting. 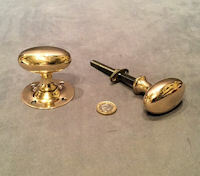 A good run of smaller than average door knobs, complete and in good and working order. Backplate 2", knob 1.75" and 2.75" front to back. Price is for each. 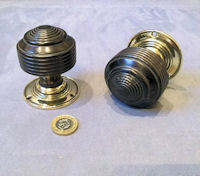 Pair of original, quality 1920's, ebony door knobs, with a square bar included to fit a standard mortice lock and latch. The replacement circular backplates have been made to suit and each have three countersunk screw holes for mounting. Complete and in good and working order. Backplate 2" diameter, knob 1.75" and 2.25" front to back. Pair of original, quality 1920's, spherical shaped cast pink brass door knobs, with a square bar included to fit a standard mortice lock and latch and circular backplates. Each backplate has four countersunk screw holes for mounting and all is complete and in good and working order. Backplate 2.25", knob 1.75" and 3" front to back. Pair of original, quality 1930's, cast pink brass octagonal shaped door knobs, with a square bar included to fit a standard mortice lock or latch. The matching backplates each have four countersunk screw holes for mounting and are stamped to the reverse, with the registation number for the year 1931. A most unusual model, the first we have seen. Complete and in good and working order. Backplate 2.5" diameter, knob 1.75" and 2.25" front to back. 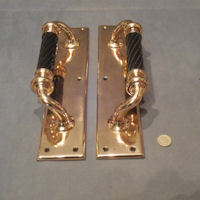 Pair of original, quality 1920's, oval shaped cast pink brass door handles, with a square bar included to fit a standard mortice lock or latch and the square backplates, each with four countersunk screw holes for mounting. 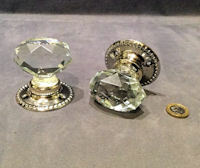 These unusual door knobs have three facets to the upper surface of the knob and all are complete and in good and working order. Backplate 2" square, knob 2.5" x 1.5" and 2.5" front to back. 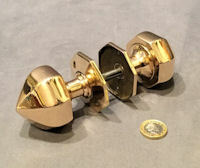 Pair of original, quality 1920's, cast pink brass hexagonal shaped door knobs, with a plain dished face and a square bar included to fit a standard mortice lock or latch and the square backplates, each with four countersunk screw holes for mounting. 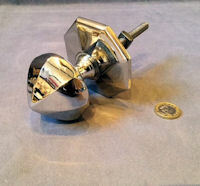 A simple, but unusual shaped pair of door knobs, complete and in good and working order. backplate 2" square, knob 1.75" diameter and 2.5" front to back. 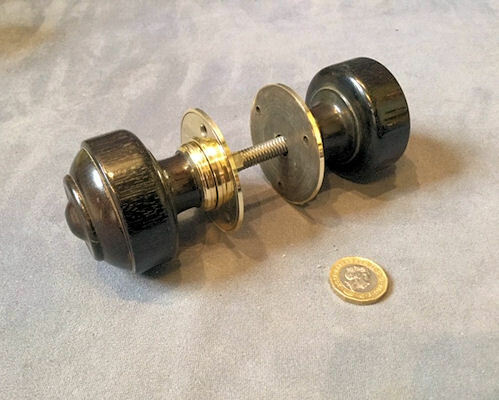 Pair of original, quality 1920's, spherical shaped ebony door knobs, with replacement brass backplates made to suit and a threaded standard square bar and grub screw adjustment system to fit both mortice and rim locks and latches. Each backplate has three countersunk screw holes for mounting and all is complete and in good and working order. Backplate 2", knob 1.75" diameter and 2.25" front to back. Price is per pair. 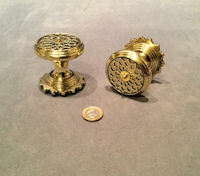 Pair of original, quality, late 19th century, turned walnut door knobs, for rim and mortice locks, with fancy petal shaped cast brass backplates, each with two countersunk screw holes to one side and four to the other. Super quality, super colour and complete and in good and working order. Backplate 2.25", knob 2" diameter and 2" front to back. Price is per pair. 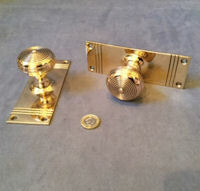 Pair of original, quality 1920's, smaller then average, spherical shaped, pink brass door knobs on circular backplates and with a square bar included to fit a standard mortice lock and latch. Each backplate has three countersunk screw holes for mounting. Complete and in good and working order. Backplate 2.25", knob 1.5" diameter and 2.25" front to back. 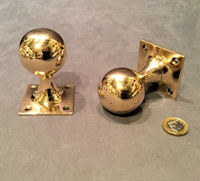 Pair of original, quality 1920's, spherical shaped, pink brass door knobs, with a threaded standard square bar and grub screw adjustment system to fit mortice locks and latches. These examples have circular backplates, each with four countersunk screw holes for mounting. Complete and in good and working order. Backplate 2.25", knob 1.75" diameter and 3" front to back. Pair of original quality, 1920's, pink brass door handles for mortice locks, will take a standard square bar (included) to turn a standard latch or lock. The ovoid shaped knobs are mounted on circular backplates, each with 4 countersunk screw holes for mounting. Complete and in good and working order. Backplate 2.5" x 3.25" front to back, knob 1.75" diameter. Pair of original, quality 1920's, oval shaped cast brass door knobs, on very long and narrow necks with small oval shaped backplates. 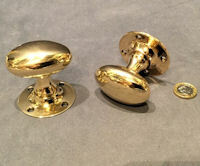 These knobs have a square bar included to fit standard mortice locks and latches. Each backplate has two countersunk screw holes for mounting. A most unusual pair of door knobs, stamped "Regd" to the reverse of the backplate. Complete and in good and working order. Backplate 1.25" x 2.75", knob 1.75" x 0.75" and 3" front to back. 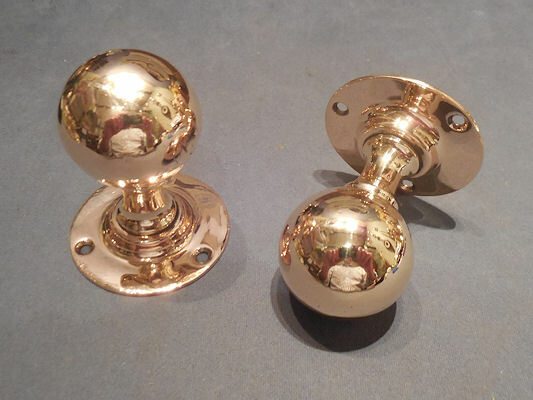 Pair of original, quality 1920's, spherical shaped, cast pink brass door knobs, with circular backplates, each with three countersunk screw holes for mounting and a square bar included to fit a standard mortice lock and latch. The reverse of the backplates are impressed for the manufacturer "Dryad, Leicester" and all are complete and in good and working order. 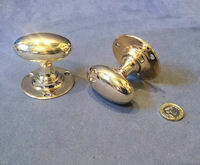 The first door knobs we have seen manufactured by this company. Backplate 2.25", knob diameter 1.75" and 2" front to back. Price is per pair. Original, quality 1920's, stunning single bronze lever door handle in the old unpolished patinated finish. This most unusual door handle has a star shaped backplate, with four countersunk screw holes for mounting, is sprung returning with a replacement internal spring fitted and has a square bar included to fit a standard mortice lock and latch. Fully overhauled, complete and in good and working order. Backplate 4.75" x 2.75", total 8.25" wide and 2.5" front to back. 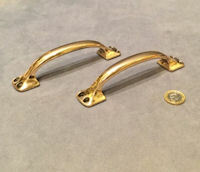 Pair of original, quality, late 19th century, cast brass door handles in the form of shaped drop ring grips on a square or diamond shaped backplate. A square bar is included to fit a standard mortice lock and latch. Each backplate has shaped outer edges and four screw holes for mounting. Polished, complete and in good and working order. A superb pair of handles of a good weight, could be converted to pulls if required on request. Backplate 2.5" square or 3.25" diamond shape, total 4" wide x 4" tall and 1.5" front to back. Pair of orignal, quality 1920's, turned walnut door knobs, with circular brass backplates, each with two countersunk screw holes for mounting. The threaded standard square bar and grub screw adjustment system will fit both mortice and rim locks and latches. The first we have seen of this model. Fully overhauled and complete and in good and working order. Backplate 2.25", knob 2" diameter and 2.75" front to back. Price is per pair. Pair of original, quality, late 19th century, spherical shaped ribbed door knobs in ebony, with petal shaped cast brass backplates. Each with two countersunk screw holes for mounting. 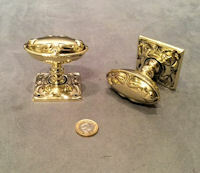 All has been fully overhauled and the brass polished and lacquered, although the lacquer may be removed at no extra cost. Complete and in good and working order. Backplate 2.25", knob 1.75" diameter and 3.25" front to back. Pair of original, quality 1920's, spherical shaped pink brass door knobs, with a square bar included to fit a standard mortice lock or latch. Each circular backplate has three countersunk screw holes for mounting and all is complete and in good and working order. Backplate 2.5", knob 1.5" diameter and 3" front to back. 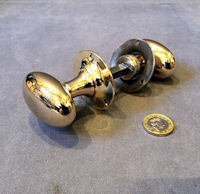 Pair of original, quality 1920's, spherical shaped cast pink brass door knobs, with a threaded standard square bar included to fit a standard mortice lock or latch. The square shaped backplates each have four countersunk screw holes for mounting and all is complete and in good and working order. Backplate 2" square, knob 1.75" diameter and 3" front to back.. Pair of original, quality 1920's, spherical shaped, pink brass door knobs, with a square bar included to fit a standard mortice lock and latch. Each circular backplate has three screw holes for mounting and all is complete and in good and working order. Backplate 2" diameter, knob 1.5" and 2.25" front to back. Pair of original, quality 1920's, turned ebony door knobs with a threaded standard square bar and grub screw adjustment system to fit both mortice and rim locks and latches. Each circular, replacement brass backplate has been made to suit and has three countersunk screw holes for mounting. All is complete and in good and working order. Backplate 2.25" diameter, knob 1.5" diameter and 2.5" front to back. Price is per pair. 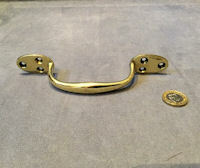 Original, quality circa 1900, cast brass single door pull / sash window lift. This chunky example has four countersunk screw holes for mounting, has been polished and lacquered, although the lacquer may be removed at no extra cost and is complete and in good and working order. 7" x 0.5" and 1.75" tall. Original, quality late 19th century oval shaped cast pink brass door pull knob with a matching circular brass backplate and a threaded bolt with a cast brass decorative slotted head for the interior. All is complete and in good and working order. Backplate 3.25" diam, knob 3.25" x 2" and 3.5" front to back. 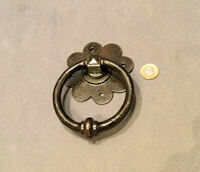 Original, quality late 19th century cast brass door pull or a very large sash window lift. This example has a tapered grip and two rectangular backplates, each with two countersunk screw holes for mounting. Polished and lacquered, although the lacquer may be removed at no extra cost and complete and in good and working order. Backplates 1.75" x 7/8" each. Total 8.5" x 7/8" and 2" tall. 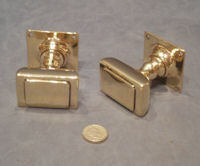 Original, quality pair of post-war unused chromed sliding door pulls. Each has four countersunk screw holes for mounting and are complete and in good order. 4" x 2" x 0.5" front to back. Original, quality late 19th century hexagonal shaped brass door pull knob with a central button to the front and a replacement circular backplate made to suit. A replacement threaded square steel bar has been fitted to enable this knob to also operate a standard lock or latch if required. Complete and in good and working order. Backplate 2.5" diam, knob 2.5" diam and 2.5" front to back. 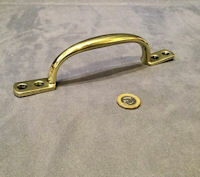 Original, quality late 19th century cast brass sash window lift / door pull handle. Each backplate has three countersunk screw holes for mounting and all has been polished and lacquered, although the lacquer may be removed at no extra cost. Complete and in good and working order. 7" x 1" and 1.75" tall. 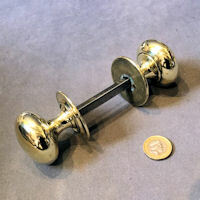 Original, quality pair of late 19th century cast brass door pull handles of the 'drop ring form' with decorative cast brass backplates, each with three countersunk screw holes for mounting. All has been polished and lacquered, although the lacquer may be removed at no extra cost and are complete and in good and working order. Most unusual handles probably continental. 5.25" wide x 4.25" tall and 1.75" front to back. Backplate 2.75" x 2.25". 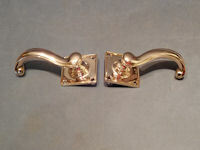 Original, quality pair of heavy brass door pull handles circa 1900 / 1920's. 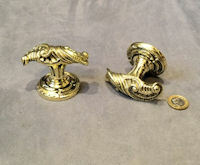 These super handles have cranked pull grips with cast brass finials all mounted on a rectangular backplate. Each backplate has eight countersunk screw holes for mounting and all has been polished and lacquered, although the lacquer may be removed at no extra cost. Some dents to the reverse side on two pull bars, otherwise all complete and in good and working order. Price is per pair. Backplates 14" x 4" and total 3.5" front to back. 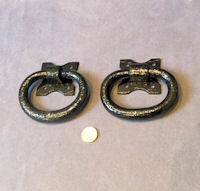 Original, quality pair of 19th century blacksmith made wrought iron ring shaped door pull handles. This pair have been cleaned and repainted black and the shaped backplates have been fixed not to turn and each have four screw holes for mounting. All is complete and in good and working order. Backplate 2.5" square, total 4.5" wide and 4.25" tall. 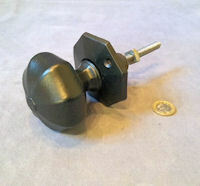 Original, quality late 19th century black ceramic door pull knob with a threaded steel bar, nut and washer. Complete and in good and working order with no chips or damage. 3" wide, 2.5" front to back and 3" threaded bolt. Original, quality late 19th century cast pink brass octagonal shaped brass door pull knob with the original matching backplate, with two countersunk screw holes for mounting. A replacement threaded square steel bar has been fitted to enable this knob to also operate a standard lock or latch if required. Complete and in good and working order. Backplate 2.75", knob 2.5" diam and 2.75" front to back. Original, quality late 19th century cast iron door pull knob with an embossed aesthetic movement design to the face of the knob and the backplate. The two piece body is held together and mounted with a bolt through the centre. The reverse of the backplate is impressed "AK&Sons" for the manufacturer "A Kenrick of West Bromwich", "No 26" for the model and with registration number for the year 1892. Cleaned and lacquered and complete and in good and working order. Backplate 3", knob 2.75", bolt 5.5" long and 3.5" front to back. 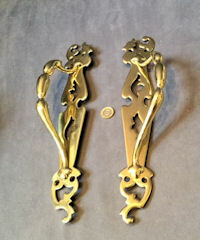 Original, quality pair of cast brass door pull handles in the Art Nouveau style. This super pair of pulls have fretted backplates, each with four countersunk screw holes for mounting, shaped and cranked handles and stamped to the front with the registration number for the year 1900 and to the reverse with "RM&S" for the manufacturer. All has been polished and lacquered, although the lacquer may be removed at no extra cost and all is complete and in good and working order. Backplates 14.5" x 2.25", total 3" wide and 2.5" front to back. Original, quality late 19th century spherical shaped black glazed ceramic door pull knob with a threaded steel bolt with a nut and washer. Complete and in good order. Knob 2.75" widest and 2.75" front to back plus 2.5" thread. Original, quality late 19th century octagonal shaped cast pink brass door pull knob with a matching backplate made to suit. The backplate has two countersunk screw holes for mounting and a replacement threaded square steel bar has been fitted to enable this knob to also operate a standard lock or latch if required. All is complete and in good and working order. Backplate 3", knob 2.25" and 2.75" front to back. 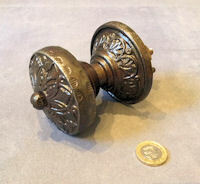 Original, quality late 19th century octagonal shaped cast iron door pull knob with a matching backplate with two countersunk screw holes for mounting. A replacement threaded square steel bar has been fitted to enable this knob to also operate a standard lock or latch if required. One small rim section is missing from the backplate but all otherwise is complete. Cleaned and repainted black and in good and working order. Backplate 3" diam, knob 3" diam and 3.25" front to back. 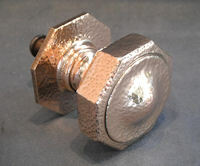 Original, quality 1920's octagonal shaped chromed door pull knob with a matching backplate. 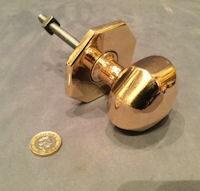 A threaded square steel bar has been fitted to enable this knob to also operate a standard lock or latch if required. Complete and in good and working order. Backplate 3.5" diam, knob 2.5" diam and 3" front to back. Original, quality late 19th century cast pink brass octagonal shaped door pull knob of good proportions with a matching backplate made to suit. A replacement threaded square steel bar has been fitted to enable this knob to also operate a standard lock or latch if required. All is complete and in good and working order. Backplate 3" diam, knob 2.5" and 2.75" front to back. 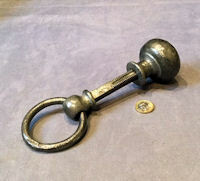 Original, quality late 19th century octagonal shaped cast iron door pull knob with a matching backplate and a threaded steel bar with nut and washer. This handle will not turn a lock or latch, only pull the door closed. Has been cleaned and repainted gloss black and is complete and in good and working order. Backplate 3" diam, knob 2.5" and 2.75" front to back. 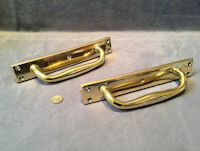 Pair of 1920's original, quality unused pressed brass flush mounted sliding door pulls. These are suitable for large cupboard or interior sliding doors. Each handle has four countersunk screw holes for mounting, is polished and lacquered, although the lacquer may be removed at no extra cost and all is complete and in good and working order. 3.75" x 2.25" and 2.75" x 1.75" to be recessed. Price is per pair. Original, quality late 19th century spherical shaped cast brass door pull knob with an aesthetic movement design and the original matching circular backplate. This example is fitted with a threaded steel bar and nut and has the registration lozenge mark for the year 1870 and 'TP&S' for the manufacturer, both impressed to the reverse of the backplate. All is complete and in good and working order. Backplate 3.25" diam, knob 3" diam and 3.5" front to back. Click on photo for larger and ohter views. 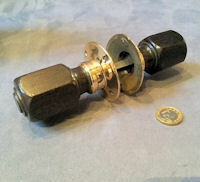 Original, quality late 19th century cast brass door pull knob in the original unpolished patinated finish, with the original matching backplate and threaded bolt, nut and washer. This handle will not turn a lock or latch, only pull the door closed. 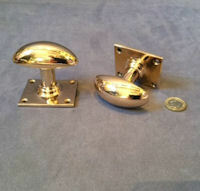 This super example can be polished to a shiny brass on request for no extra cost. Complete and in good and working order. Backplate 3.25" diam, knob 2.75" x 3" front to back. 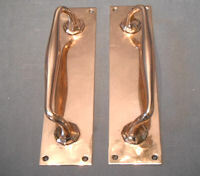 Pair of original, quality 1920's cast brass cranked door pulls with rectangular shaped backplates. Each backplate has five countersunk screw holes for mounting and each grip is tapered from the centre. Polished and lacquered, although the lacquer may be removed at no extra cost and complete and in good and working order. Backplate 11.25" x 2", total width 2.5" and 2.5" front to back. Price is per pair. 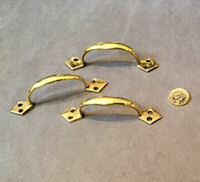 Original, quality late 19th century cast brass small cupboard door pulls or sash window lift. The tapered and shaped pull bar is mounted on two diamond shaped backplates each with two countersunk screw holes for mounting. All has been polished and lacquered, although the lacquer may be removed at no extra cost and is complete and in good and working order. Total length 4.5" and 1.5" front to back. Backplate 0.75" wide. Price is for each. 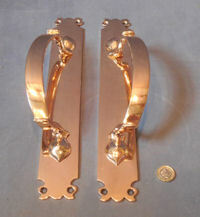 Original, quality pair of late 19th century cast pink brass door pulls in an Art Nouveau style. The backplates have shaped ends, each with two countersunk screw holes for mounting and the handle are cranked and tapered. All has been polished and lacquered, although the lacquer may be removed at no extra cost and is complete and in good and working order. Backplate 14" x 2", total 3" widest and 2.75" front to back. Pair of original, quality late 19th century cast pink brass door pull handles with candy twist carved ebony grips. These superb examples have rectangular backplates, each with six countersunk screw holes for mounting and cranked handles. The ebony grips have shrinkage splits but are good and solid otherwise, and the brass has been polished and lacquered, although the lacquer may be removed at no extra cost. All is complete and in good and working order. Backplates 14" x 3" x 0.25". Total 3.5" wide and 3" front to back. Original, quality late 19th century cast brass drop ring handle, originally from a strongroom door now converted for use as a door pull or turning handle. The circular backplate has two concealed countersunk screw holes for mounting, and the threaded square bar is a replacement made to suit and to fit a standard mortice or rim lock or latch. The reverse of the handle is impressed for the original maker of the safe / strongroom "Chatwood's Bolton". All is complete and in good and working order. Backplate 3.25" diam, handle 4.75" wide x 4" tall and total 5" tall. Original, quality late 19th century cast brass drop ring handle originally from a strongroom door, now converted for use as a door pull or turning handle. 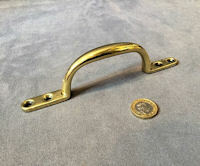 The circular brass backplate is a replacement made to suit as is the threaded square bar which will fit a standard mortice or rim lock or latch. All is complete and in good and working order. Backplate 3.25" diam, handle 4.5" wide x 3.5" tall and total 5" tall. 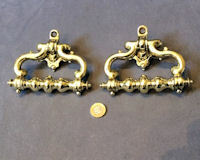 Original, quality pair of late 19th century, cast brass door pull handles mounted on the original shaped sheet brass rectangular shaped backplates. Each backplate has six countersunk screw holes for mounting and replacement bolts have been made to mount the art nouveau shaped grips to the backplates. Interestingly the grips are in pink brass and the backplates are yellow, yet all have been together from new. Polished and lacquered, although the lacquer may be removed at no extra cost and complete and in good and working order. Backplate 14.25" x 2.25", total 3" wide and 2.5" front to back. Pair of original, quality, late 19th century, cast pink brass door pulls with shaped and cranked pull bars mounted on vertical rectangular shaped backplates. Each backplate has five countersunk screw holes for mounting and all has been polished and lacquered, although the lacquer may be removed at no extra cost. A super pair of heavy door pulls. Complete and in good and working order. Backplate 15.5" x 2", total 3.5" wide and 2.5" front to back. 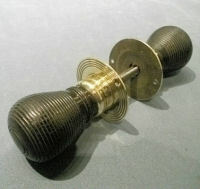 Pair of original, quality, late 19th century, cast brass door pulls with ribbed ebony grips to the centre. These superb pull handles have shaped brass backplates, each with six countersunk screw holes for mounting, cranked bars with decorated mounts and probably the best ebony pull grips we have seen. Complete, in great condition and in working order. Total length including backplate 16", backplate 2" wide and total 2.25" wide and 2.25" front to back. 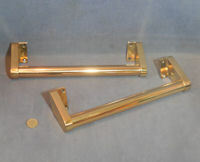 Pair of original, quality 1920's / 30's, cast pink brass door pull handles with rectangular shaped backplates, with curved off corners and five countersunk screw holes to each for mounting. Each backplate is fitted with a cranked and tapered curved pull bar and are impressed to the reverse for the manufacturer "W R Leggett Ltd". All has been polished and lacquered, although the lacquer may be removed at no extra cost. Complete and in good and working order. Backplate 15" x 2.5", total 3" wide and 2.75" front to back. A matching pair of fingerplates may well be available reference code FP199. 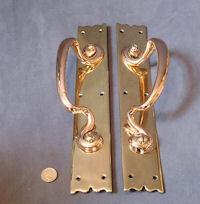 Pair of original, quality 1930's / 40's, pink brass door pulls of a plain form. The round bar grips are mounted on cast brass support brackets, each with two countersunk screw holes for fixing. Polished and lacquered, although the lacquer may be removed at no extra cost. Complete and in good order. 12" x 3" tall in total and 2.5" front to back. Original, quality, late 19th century, superb single oval shaped door handle, with the original circular backplate, converted to a door pull. A replacement threaded square steel bar has been fitted so will also operate a standard lock or latch. The backplate, originally nickel plated, has a concealed fitting so when mounted, no screws are visible. 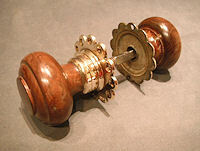 The backplate is stamped "Gibbons Patent", a super door pull knob, which could still be used as a turning knob. Some minor damage to the backplate, but otherwise complete and in good and working order. Backplate 2.5", knob 2.5" x 2", 2.75" front to back. Original, quality 1920's, large cast pink brass, octagonal shaped door pull knob, this will not turn a lock or latch, only pull the door closed. Impressed to the back in script for the manufacturer "Kayes Leeds". This superb example has a flat front to the design, matching backplate and a good large dome headed brass threaded bolt and steel washer for mounting. Some minor pitting overall, however complete and in good and working order. Backplate 3.75" diameter, knob 2.75" diameter, total 3" front to back. Original, quality late 19th century, spherical shaped brass door pull knob with a matching circular backplate and a threaded steel bolt. 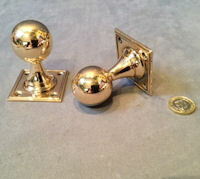 The knob and backplate both have embossed Aesthetic Movement designs, with the detail on the knob worn from use. The reverse of the backplate is marked with the registration lozenge mark dated for 1842 - 1883. A replacement threaded square steel bar has been fitted to enable this knob to also operate a standard lock or latch if required. Complete and in good and working order. Backplate 3.25, knob 3" and 3.5" front to back. Pair of original, quality, heavy decorative cast pink brass door pulls, with a shaped and beaded outer rim to the backplates and superb cranked and curved pull handles, finished with acanthus leaf decoration. Each backplate has eight countersunk screw holes for mounting and the reverse is impressed with the registration number for the year 1905 and for the maker "Gibbons of Wolverhampton". 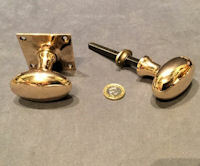 Well above average quality door pulls, polished and lacquered, although the lacquer may be removed at no extra cost and complete and in good order. Backplates 15" x 3", total width 4.25" and 2.5" front to back. Original, quality, serious Art Nouveau style, circa 19900, exterior brass door pull knob, with a soft edged, triangular shaped knob on a tapered neck and a shaped cast brass backplate of a sinewy plant form, with embossed decoration and three screw holes for mounting. This handle will not turn a lock or latch, only pull the door closed. The reverse is stamped "Rd" and has a replacement threaded bar and nut. Complete and in good and working order. Backplate 4" x 3.75", knob 2.5" x 2.25" and 3" front to back. Original, quality, octagonal shaped cast pink brass door pull knob, with a matching plate and an overall dimpled and hammered finish. The reverse is impressed with the registration number for the year 1914 and all is complete and in good order. Backplate 3" diameter, knob 3" diameter and 2.75" front to back. 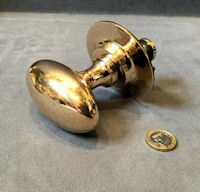 Original, quality 1920's, cast brass, central door pull knob, of a dished rectangular shape, with a square backplate and a threaded steel bolt and washer. The reverse is impressed "JCS" for the manufacturer and all is complete and in good and working order. Backplate 2.5" square, knob 2.75" x 1.75" and 2.5" front to back. 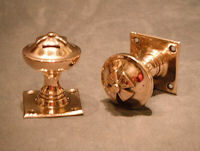 A long run of original, quality, cast pink brass, flush mounted sliding door handles, circa 1900. These would be suitable for large cupboard or interior sliding doors. Each handle has four countersunk screw holes for mounting, is polished and lacquered and is complete and in good and working order. 5" x 2.75" and 4" x 2" x 1" to be recessed. Price is per pair. 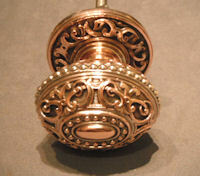 Original, quality, cast pink brass door pull knob, circa 1880. An unusual form with the original matching backplate. This handle will not turn a lock or latch, only pull the door closed. All has been polished and is complete and in good and working order. Backplate 4.5" x 3.25", knob 3.75" x 2.5" and 2.75" front to back. Original quality, late 19th century, stunning cast brass door pull in the Gothic style. Complete and in good and working order. Would convert to a door knocker without too much trouble and could be done on request. 8" tall x 7" wide x 1.5" front to back. 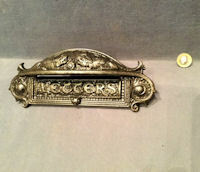 Original, quality late 19th century very decorative cast iron letter flap with integral door pull. This example has mythical creatures to the upper section and a pull up / drop down letter flap detailing "Letters" in fancy upper cased text. Replacement threaded bolts, nuts and washers have been fitted. All has been cleaned and lacquered and is complete and in good and working order. 9.5" x 3.5" and 1.5" front to back. Aperture 5.25" x 1". Original, quality pair of 1920's teak yacht cleats with cast pink brass mounting brackets. Each bracket has two large countersunk screw / bolt holes for mounting and a good oval shaped teak bar. Not only good to go back onto a boat but ideal as door pulls. Polished and lacquered, although the lacquer may be removed at no extra cost and complete and in good and working order. Backplates 4.5" x 1.75" and 8.25" max width. Total 16.5" x 4.5" and 3.75" tall. Original, quality late 19th century cast pink brass sash window lift also ideal for a door pull. This example has a tapered grip and two backplates, each with two countersunk screw holes. Polished and lacquered, although the lacquer may be removed at no extra cost and complete and in good and working order. Total 6.25" long x 0.5" and 1.5" tall. 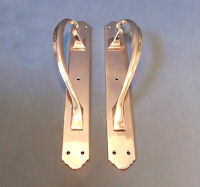 Original, quality pair of 1920's cast pink brass sash window lifts or door pulls. This pair have square shaped ends, each with two countersunk screw holes for mounting. Polished and lacquered, although the lacquer may be removed at no extra cost and complete and in good and working order. 6" x 1.25" x 1.25".